It’s time for another installment of “Return to the Road,” in which I document the non-ballpark wanderings that occurred during my 2015 road trips. I’ve already chronicled my experiences in Florida and the Midwest; now it’s time to move on to my late June trip to Virginia (and the state west of Virginia. I forget what it’s called). I arrived in Richmond on the evening of June 24, having driven there from good ol’ NYC (where the cost of living is totally reasonable and never causes me angst). 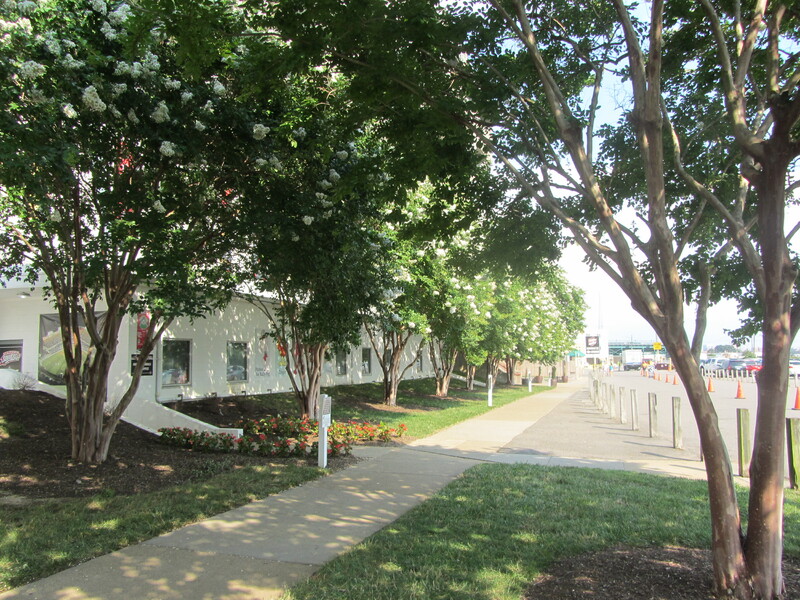 Before heading to The Diamond for the June 25 Flying Squirrels game, I had a little time to poke around. And when I poke around, I inevitably end up at a record store. First up was Deep Groove. Deep Groove was a small, all-vinyl spot. If I recall correctly, I bought the recent reissue of Guided By Voices’ classic Bee Thousand album. I also recall that on the counter, under glass, was a great assemblage of Richmond-area concert ticket stubs spanning the last three-plus decades. One of the stubs was for a D’Angelo show that had taken place the previous week; this prompted me to tell the clerk that I had seen D’Angelo play in Queens just three days prior. “That’s tight,” replied the clerk, who was completely disinterested and also young enough to use “tight” as a synonym for “cool.” I left the shop feeling like a pathetic old dude, but then I started thinking about this D’Angelo song and the pep came back into my step. Would you believe that I ended up at another record store? Plan 9 was much larger than Deep Groove, and far more ramshackle. There was a little bit of everything. It was tight. Usually, when on a road trip, I bring along three CDs I haven’t listed to and listen to them three times each. I should probably be diagnosed with something. But on this trip I had forgotten to bring any CDs, so I went ahead and bought a few at Plan 9 so I could listen to them in the car for the rest of the trip. My new acquisitions were Willie Nelson and Merle Haggard “Django and Jimmy,” AC/DC “Rock or Bust” and Shamir “Ratchet.” I also picked up a used copy of Don Cherry’s “Eternal Rhythm” on vinyl. All right, enough with the record stores. Please note that, at this moment in time, the Byrd Theater was showing Insurgent and Get Hard. I don’t know anything about either of those movies, but they seem unbefitting to a theater of such age and (assumed) grandeur. I also enjoyed wandering through Chop Suey Books, which had multiple levels and many rooms. This photo was taken on the second floor, where I found (and bought) a used paperback of Damon Runyon short stories. WonTon was indeed resting in his natural habitat. Early the next afternoon, before leaving Richmond for good, I returned to Carytown and got lunch at the Daily Kitchen. Three side dishes make a meal! I wasn’t dining alone, for the Daily Kitchen is not the type of place in which I would eat alone (it was crowded and chic, so my self-consciousness levels would’ve been through the roof). 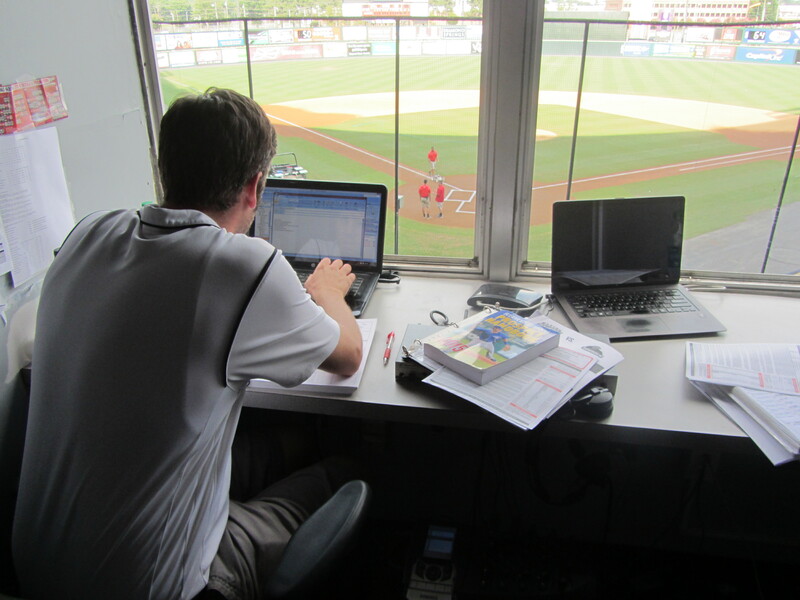 My companions were Richmond Flying Squirrels broadcaster Jay Burnham and his Trenton counterpart, Adam Giordino. Jay used to work in Trenton, and Adam was the one who replaced him. It was cool spending a couple of hours with those guys, which included a brief automotive tour of Richmond courtesy of master chauffeur Jay Burnham. But all good things must come to an end, and thus I was soon on the road to Norfolk with only a new CD to keep me company. In Norfolk, the next post shall begin. 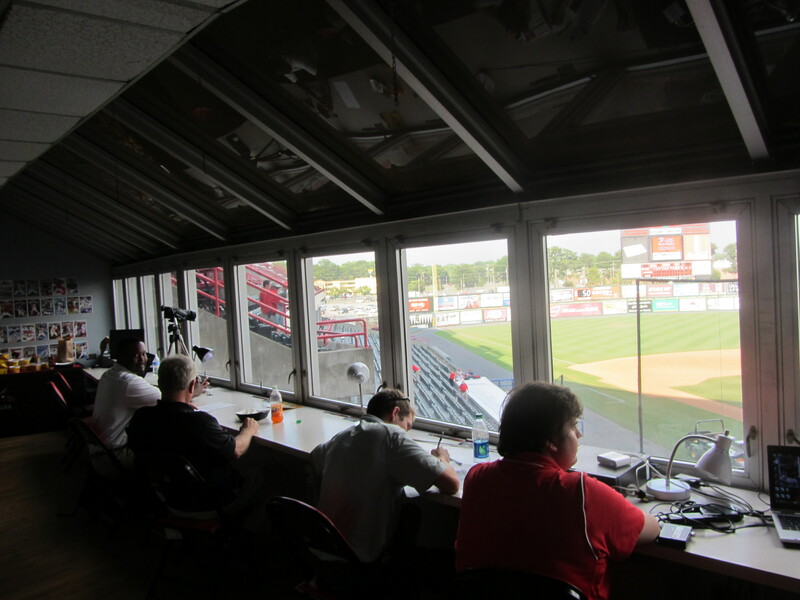 To see all of posts from my June 25, 2015 visit to the Richmond Flying Squirrels (this is Part Three) click HERE. To see all of the posts from my May 2015 trip through the Virginias, click HERE. To see ALL of my “On the Road” posts (going back to 2010), click HERE. 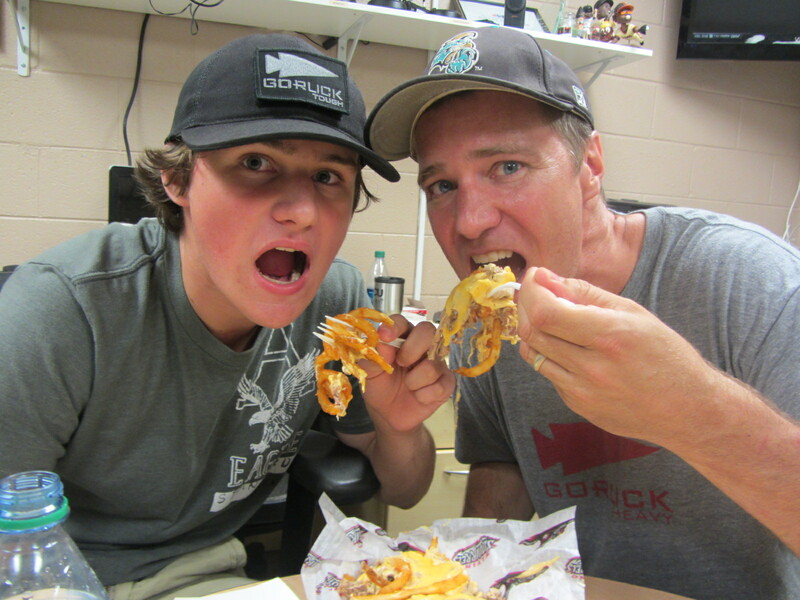 There are few things more American than a father and son enjoying a baseball game together, especially if said father and son supplement their ballpark experience by eating a bunch of food together in a windowless room while a traveling niche blogger takes pictures of them. This was the situation at Richmond’s The Diamond on June 25th, when my designated eaters (you know, the individuals who consume the ballpark cuisine that my gluten-free diet prohibits) were the father-son tandem of Stuart (on the right) and Turner Jordan. A windowless office within the bowels of The Diamond is probably not the most ideal place to have a ballpark meal, but under the circumstances, it was a pretty good option. 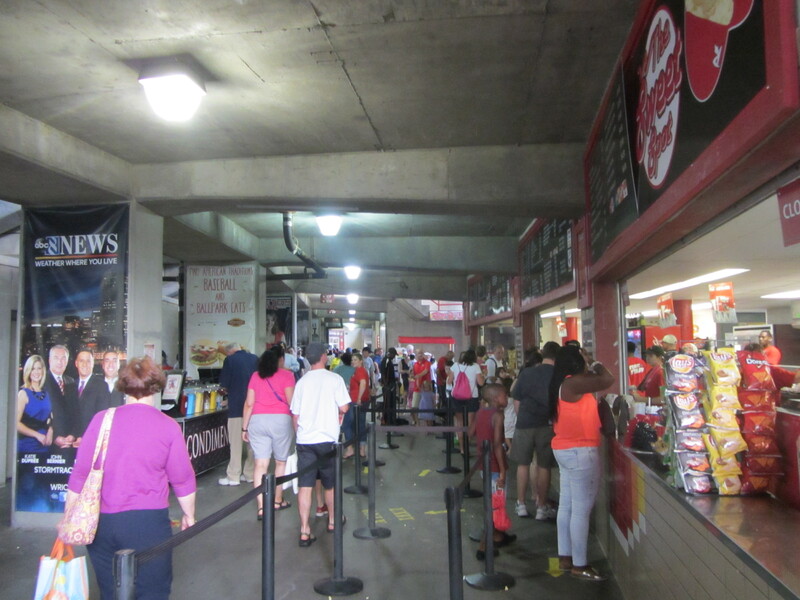 It was raining outside, the game was in a delay and The Diamond concourse was packed with people who easily could’ve impeded on our operation. As for why he wanted to be the Designated Eater, Stuart said “I saw your blog pop up and thought ‘Ah, that’s pretty cool. '” He is a regular visitor to MiLB.com, becoming more invested in the Minors after his nephew, Daniel Bowman, was drafted by the D-backs and spent some time in their system. (Daniel is now an assistant coach at East Tennessee State). 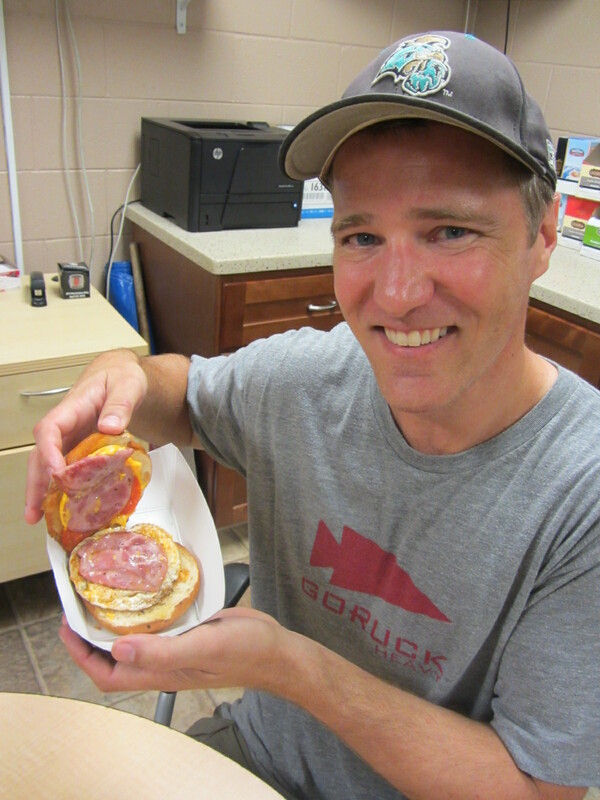 We began our sedentary food tour, graciously overseen by Flying Squirrels food and beverage manager Michael Caddell, with the Boss Hog. 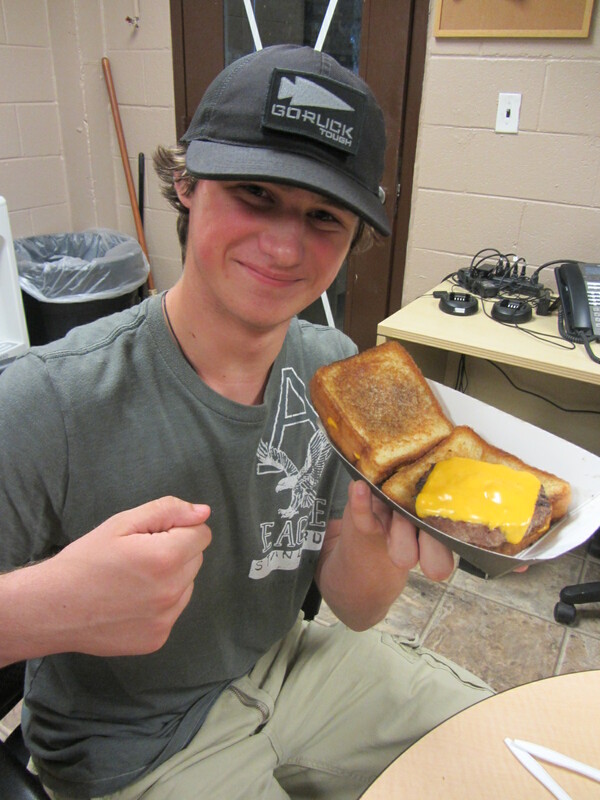 Meanwhile, Turner was ready to try the Grilled Cheese Cheeseburger, which is fairly self-explanatory. 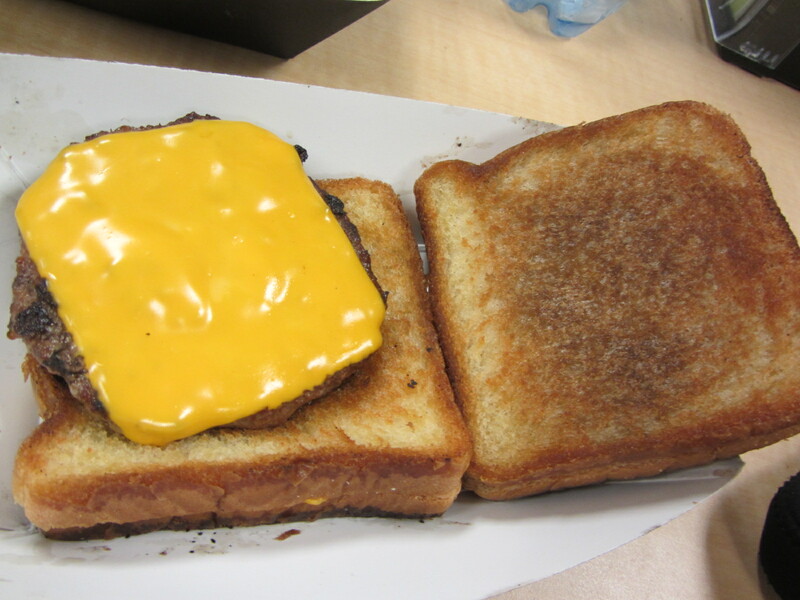 All told, there are six or seven pieces of cheese residing within this thing. It’s cheese on cheese on cheese. 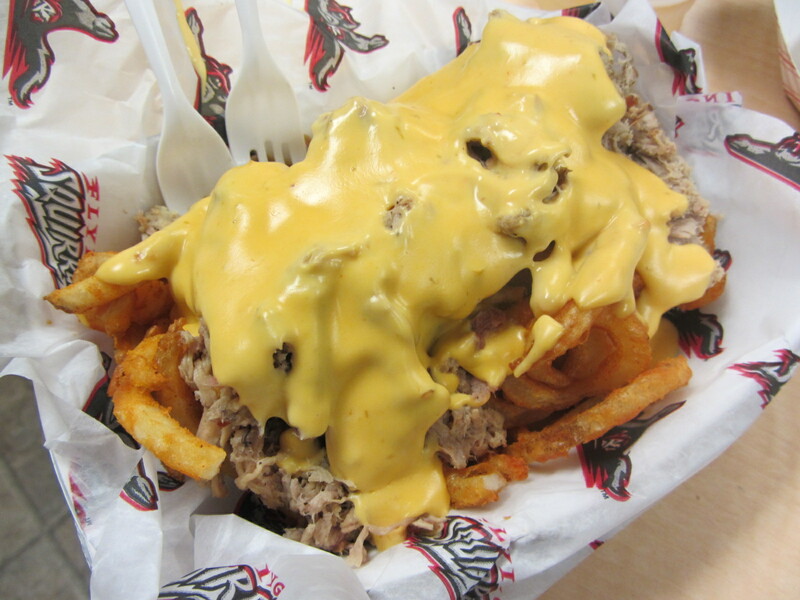 Next up was the BBQ Pork Fries, in which the team’s Cajun-seasoned Squirrely Fries are loaded up with a North Carolina-style vinegar-based barbecue sauce, pulled pork and jalapeno nacho cheese sauce. (Not pictured: a side of cole slaw.) Sporks are usually required. Turner, however, was not much of a fan. 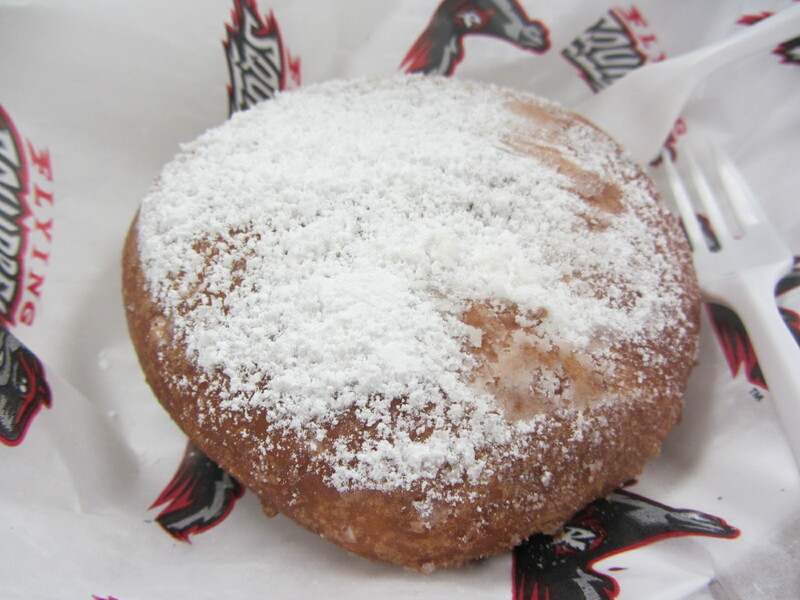 What Turner can, and did handle, was this Deep-Fried PB&J. This is, quite simply, a Smuckers Uncrustable dipped in funnel cake batter. “It’s good,” said Turner, a rising junior of few words. “It’s really good, and you could stick some bacon in the middle of that,” said Stuart, who now had bacon firmly on the brain. In addition to bacon, Stuart is also a proponent of beer. This, at least according to Turner. Nothing wrong with having a beer after work, and nothing wrong with having a beer at the ballpark. 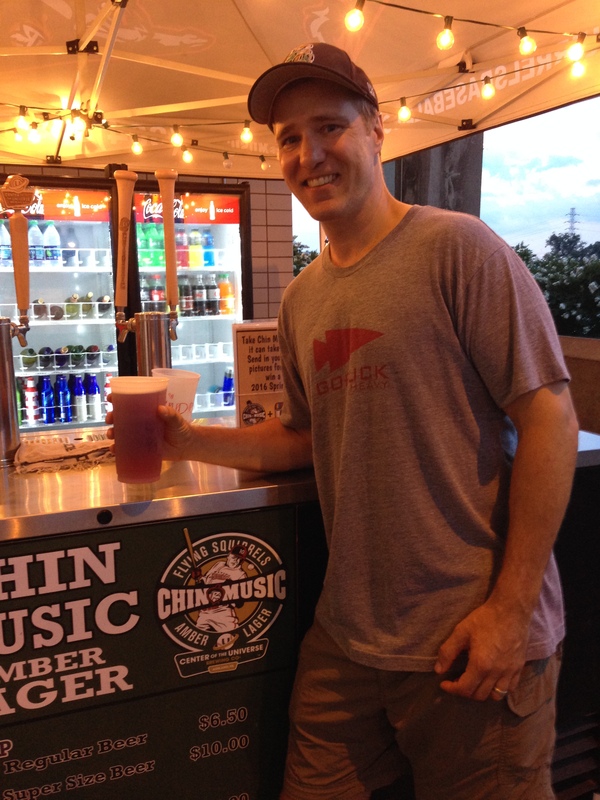 It was time for us to depart this office lair, so that Stuart could enjoy the Flying Squirrels’ signature “Chin Music” amber lager, brewed by Center of the Universe (a local brewery co-owned by former Major League hurler Chris Ray). Note, in the above photo, how the tap handles are made from Louisville Sluggers. Note, also, that Stuart was happy to be drinking a beer. And thus, we say goodbye to the Jordans. The weather had cleared by this point, and it was time for them to watch some baseball. 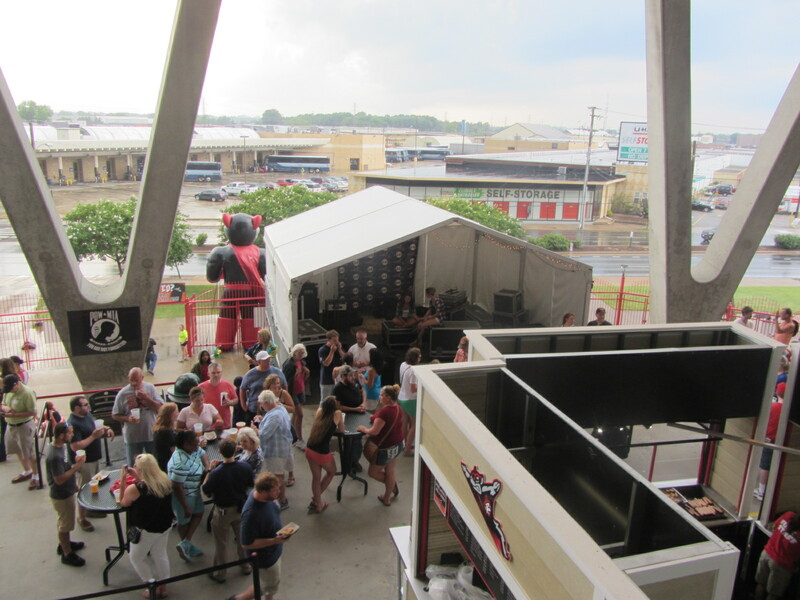 To see all of posts from my June 25, 2015 visit to the Richmond Flying Squirrels (this is Part Two) click HERE. To see all of the posts from my May 2015 trip through the Virginias, click HERE. To see ALL of my “On the Road” posts (going back to 2010), click HERE. 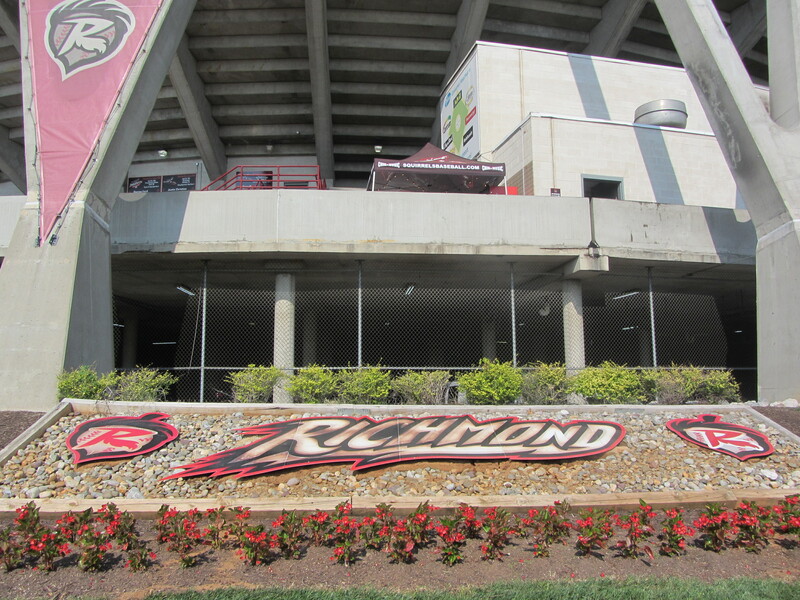 June 25th’s Richmond Flying Squirrels game, at which I was in attendance, did not begin on time. 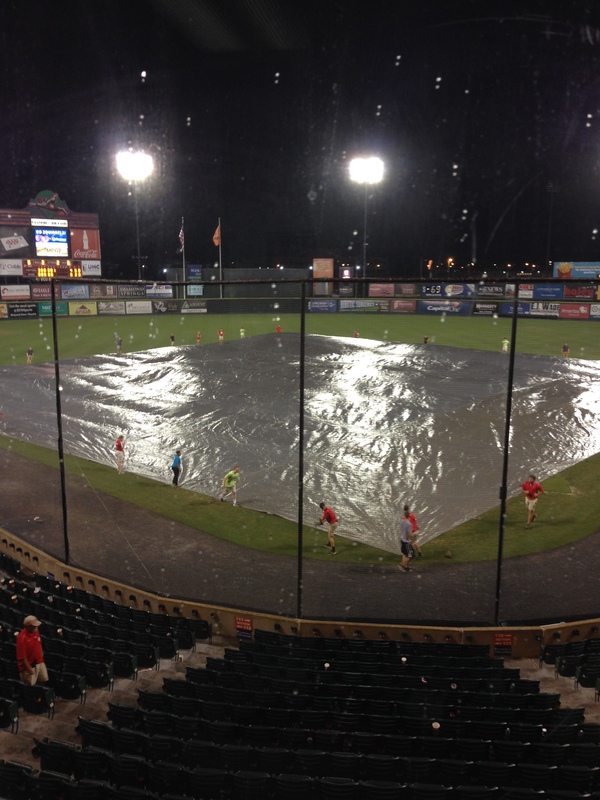 Just prior to the scheduled 6:35 p.m. start, the tarp was put on the field. 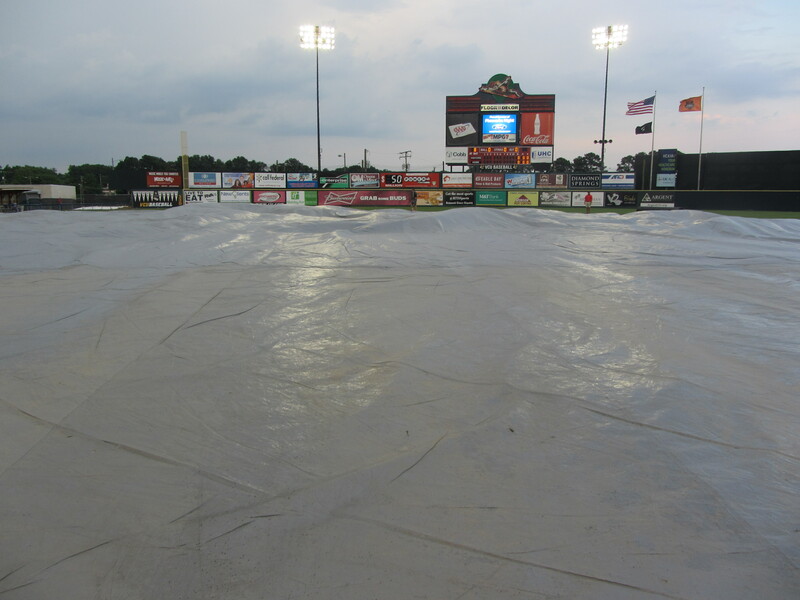 It wasn’t raining at the time that the tarp was administered, but the forecast was grim and preparation is key. With the tarp on the field, I had (even) more time to wander the concourse. Or concourses, in the case of the multi-level The Diamond. Scenes like this give me flashbacks to my Philadelphia-area youth, when I attended many a game at Veterans Stadium. This is my original conception of what a concourse was, and could only be: a dim concrete bunker. 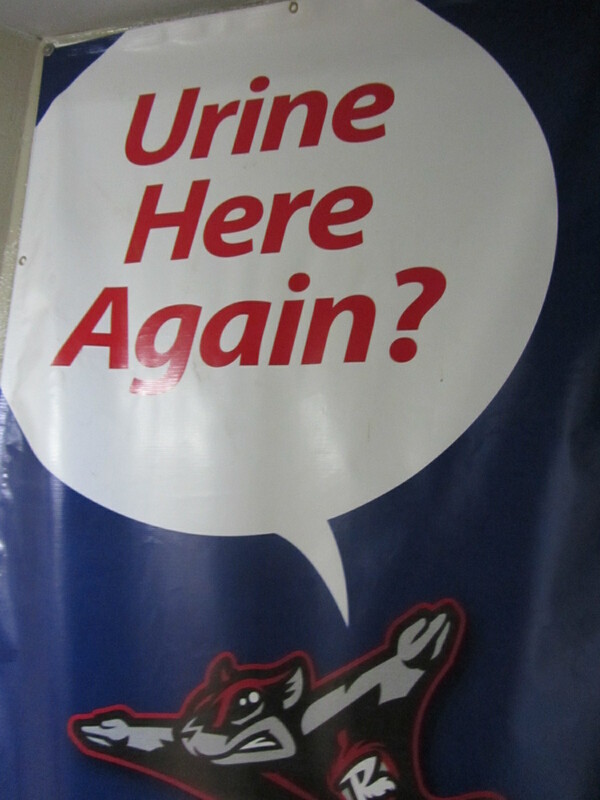 And, actually, no, it was my first time visiting this particular men’s room. You must have confused me with someone else. While traversing these elevated environs, I made the acquaintance of usher Tom Taylor. 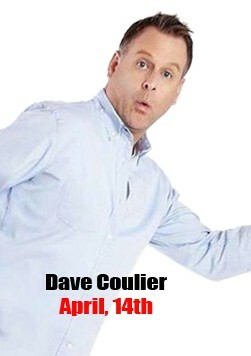 Taylor, as befits an usher and as the above photo illustrates, is a gregarious fellow. He brings bags of leftover promo souvenirs to every game — koozies and t-shirts and whatnot — so that he can distribute them to the fans in the section. 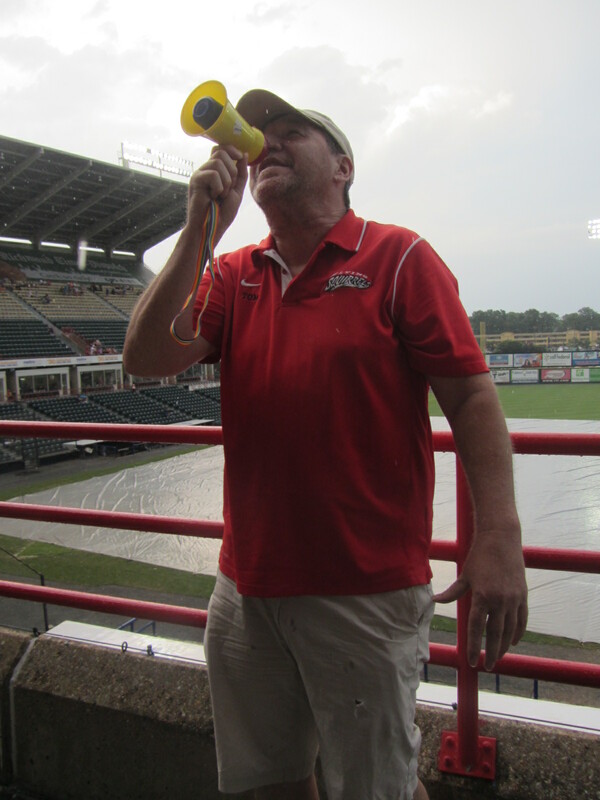 He dances during the seventh-inning stretch and, yes, even uses his megaphone during a rain delay. 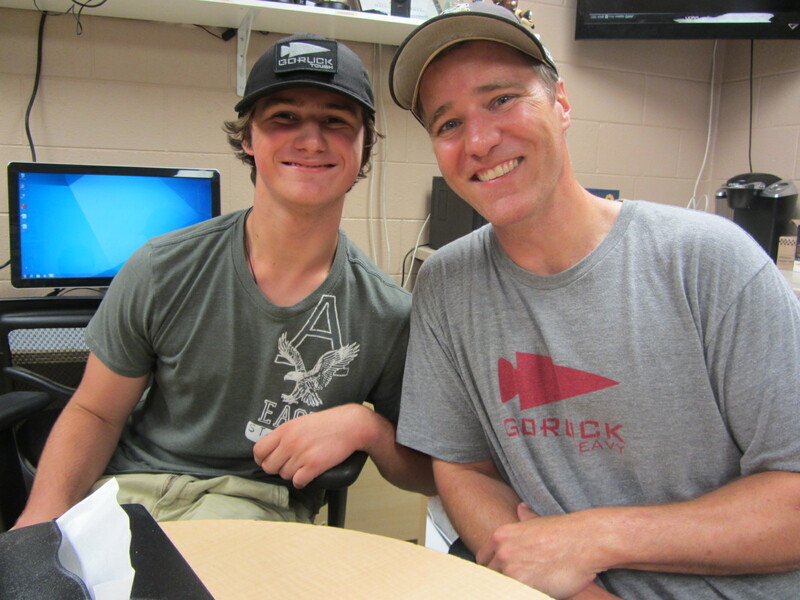 After parting ways with Taylor, it was time for a rendezvous with my designated eater, Stuart Jordan, who was joined by his son, Turner. We’ll get to know them in the next post. By the time I parted ways with the Jordans, the tarp was off the field and the game had begun. Having had enough of the concourse, I returned to field level and ran smack dab into this guy. 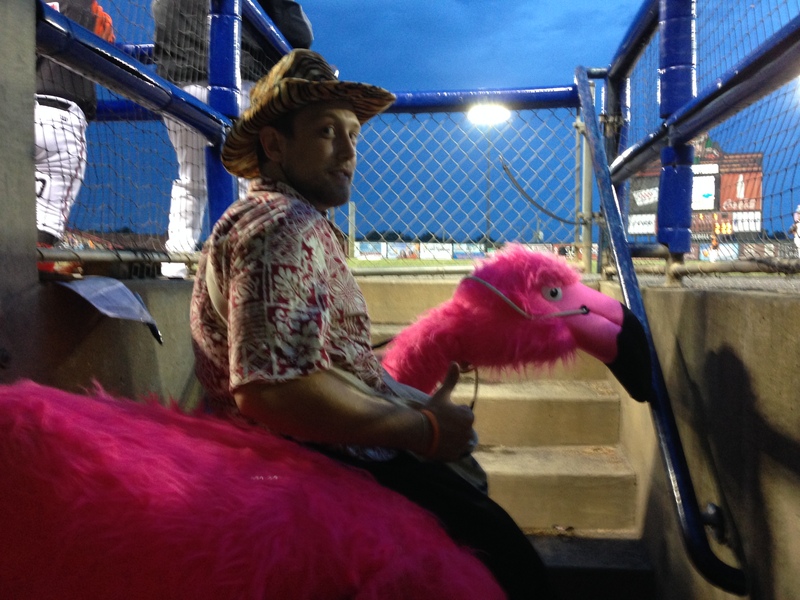 That’s the Wacky Hot Dog Vendor, riding Flingo the Flamingo. This, of course, is a blatant rip-off of homage to Reading’s Crazy Hot Dog Vendor (who rides an ostrich). Unfortunately, I missed (or failed at documenting) most of the between-inning promos dedicated to the Robin Williams/Jumanji theme. According to a game script that I obtained, this included a “Three Magic Wishes” contest (Aladdin), a Flubber dunk, Jumanji dice roll, and a Lost Boys vs. Hook race. 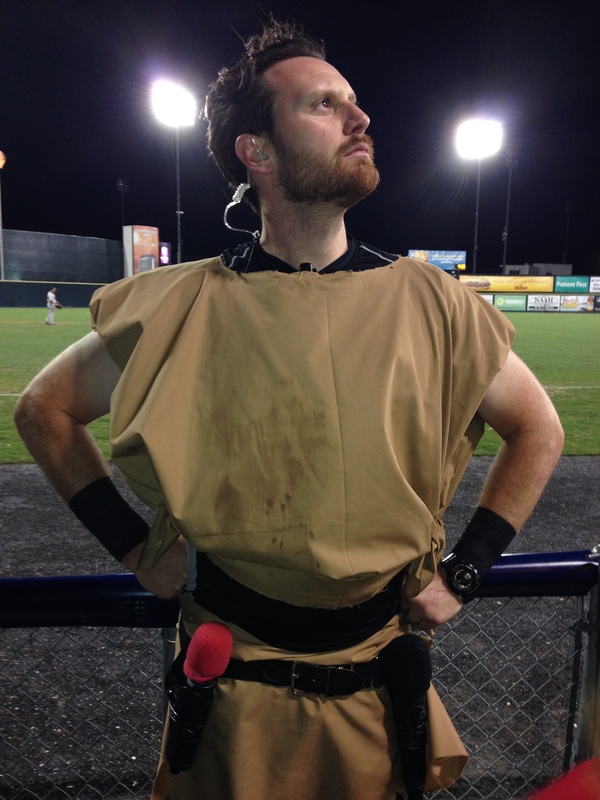 Here’s on-field emcee Murph, getting ready to announce the Lost Boys vs. Hook race (the Lost Boys were the young contestants, Hook was played by the team’s pirate mascot Captain Ahrr-VA). While I didn’t get any decent photos of the race itself, I did get some photos of other people watching the race. This, right here, is classic Minor League Baseball: a gaggle of spectators (family members of the race participants) standing right next to the visiting bullpen. It’s like these two classes of ballpark denizens are in two separate worlds, despite the overwhelmingly close proximity. To the right of the spectators is the bullpen itself. I would be remiss in my duties if I did not mention a recurring aspect of the Flying Squirrels’ gameday entertainment, which is the mid-5th inning appearance of Parker the Rally Pig. It’s pretty simple, really. Parker is wheeled out onto the field in a custom-made chariot, by a lucky intern wearing a pig nose. Running behind him are two or three fans, also wearing pig noses. 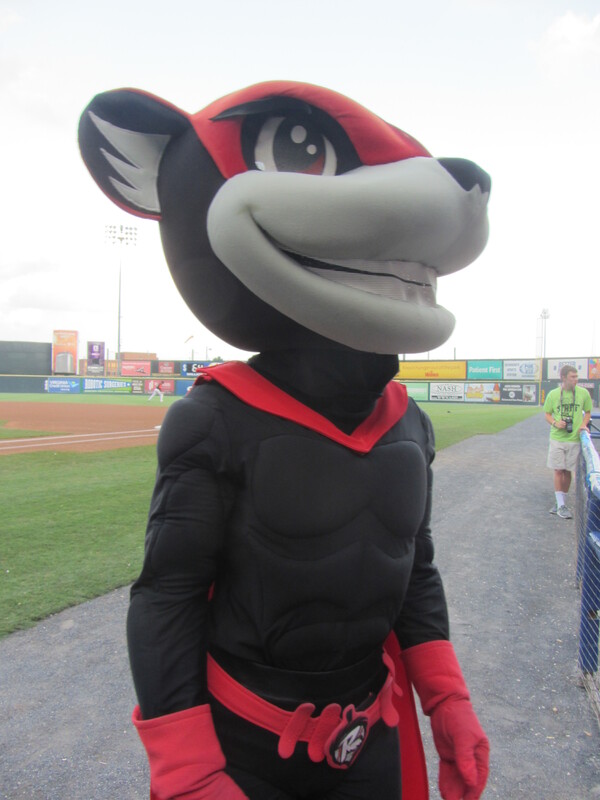 The appearance of Parker on the field is, as his name would imply, meant to spark a Flying Squirrels rally. 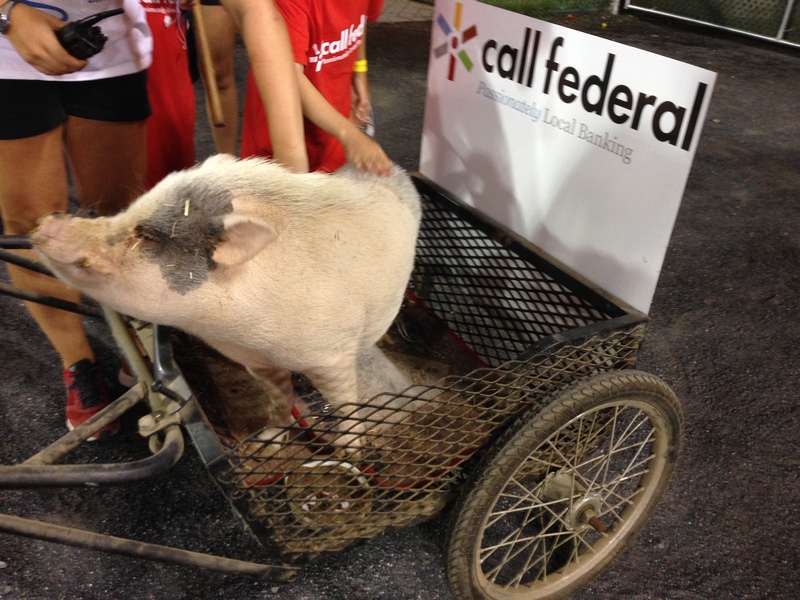 This is surely the only sponsored Rally Pig chariot in Minor League Baseball. Whoever negotiated this deal with Call Federal should get a raise. It had been a long day, and I was off my documentation game. Instead of positioning myself on the third base side of the stadium, at the end of Parker’s route, I instead ran behind his entourage. 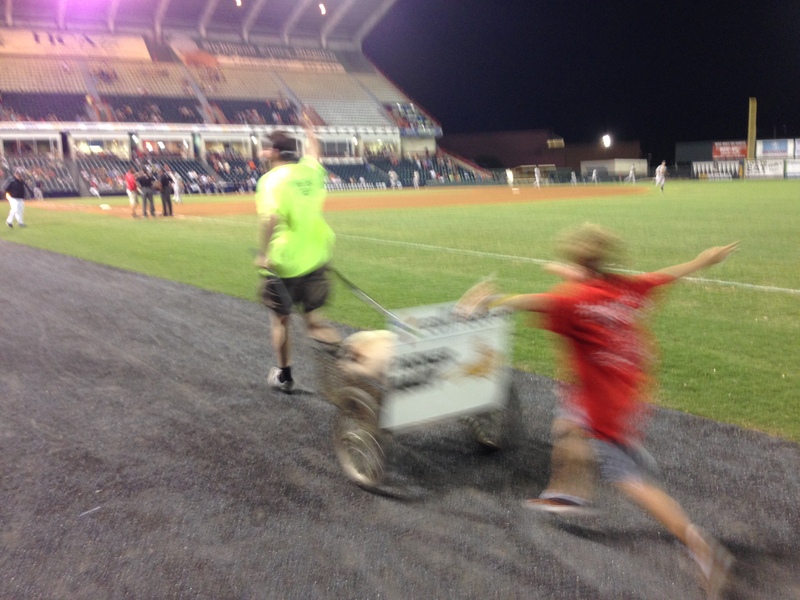 Blurriness ensued (plus, I nearly got beaned by a wayward pitch while running behind the mound). It was clear that the rains were gonna come monsooner or later, so I sought safety in the press box. Within minutes, this was the scene. Vic Buttler’s RBI single with two outs in the ninth inning lifts the Curve to a 3-2 victory, a decidedly non-awful conclusion to the evening’s contest. However, the Curve have some post-game entertainment planned — A “Laaser Show,” to be exact. The vast majority of the 4,007 fans in attendance remain in their seats, eager to witness a Minor League first. Most of them will soon regret this decision. The lights go dim, and the dramatic strains of “The Final Countdown” fill the stadium. With the tension mounting, front-office employee Jon Laaser appears on the field. Glow sticks are attached to his body. Laaser then entrances the crowd with his slinky, seductive dance moves, until the music is mercifully cut off, and the lights go back on. Awful Night V has finally concluded. Meanwhile, the rain kept on coming. 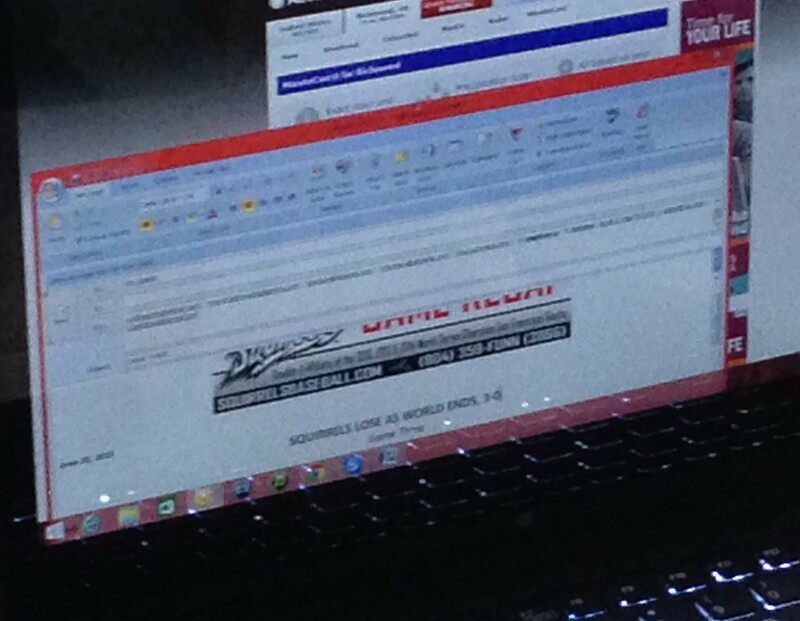 Laaser’s first headline draft was “Squirrels Lose as World Ends,” 3-0. 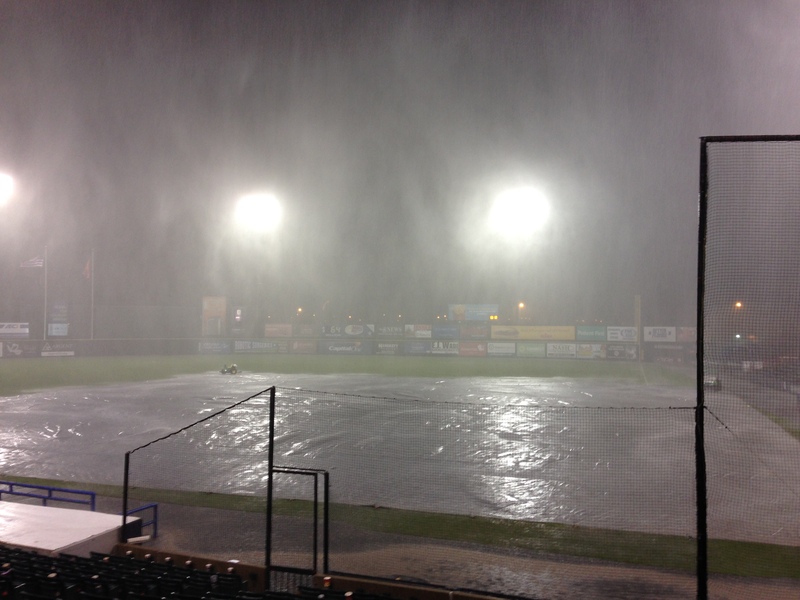 While waiting out the deluge, I recorded by Groundbreaking and Subversive Ballpark Joke of the Day (patent pending). After the game was called, I spent an hour or so at “Parney’s Pub,” a makeshift front office gathering space created by (and presided over) by team VP Todd “Parney” Parnell. 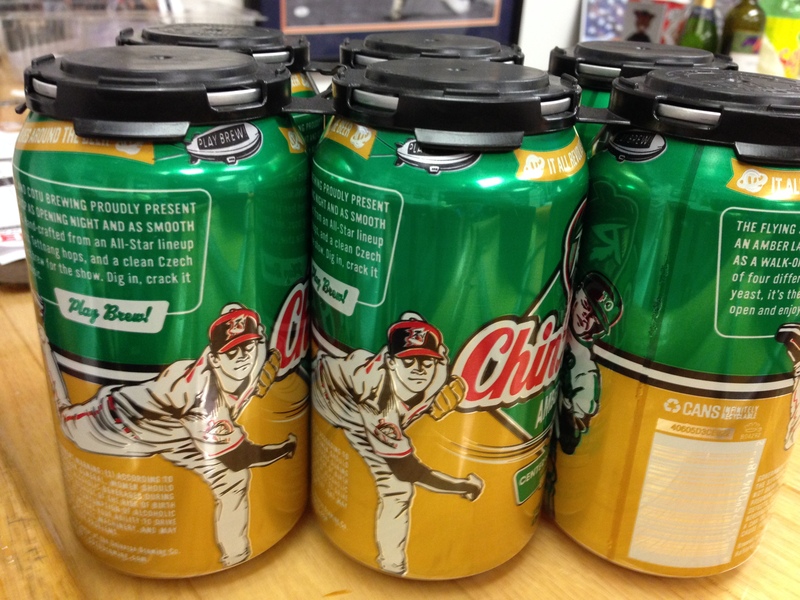 Cheap domestics are the order of the day — but the more discerning consumers made sure that the team’s own “Chin Music” beer was available as well. (As for me, my gluten-free needs were accommodated by a local cider; it was sharp and crisp and not too sweet but, alas, the name escapes me). It was a fun, inclusive scene at “Parney’s Pub.” When I left, Parney could be found outside of the clubhouse playing just-promoted reliever Josh Osich in one last game of Golden Tee. But I had (approximately 15) miles to go before I slept, and headed out to the rental car. Good night, The Diamond. And fare thee well. 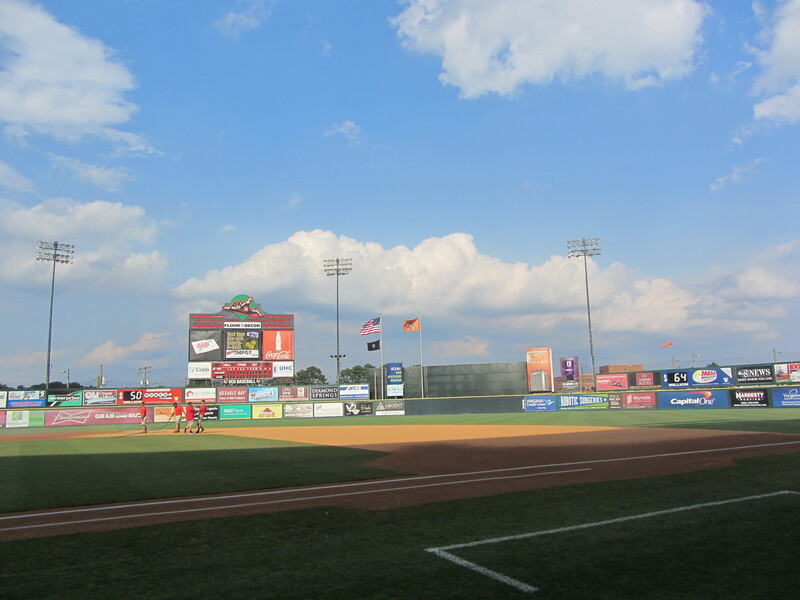 To see all of posts from my June 25, 2015 visit to the Richmond Flying Squirrels (this is Part One) click HERE. To see all of the posts from my May 2015 trip through the Virginias, click HERE. To see ALL of my “On the Road” posts (going back to 2010), click HERE. I don’t really want to get into it, “it” being the seemingly eternal stadium debate that surrounds Richmond’s The Diamond. 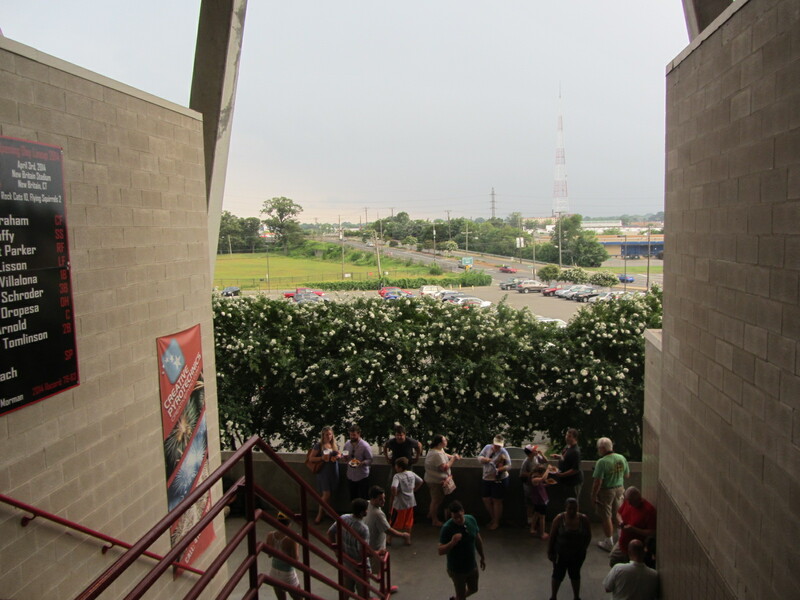 The facility, a massive concrete slab conveniently located just off Interstate 95, opened in 1985 and hosted the Triple-A Richmond Braves from that season through 2008. The Braves departure was largely due to their dissatisfaction with The Diamond’s increasingly dilapidated condition. 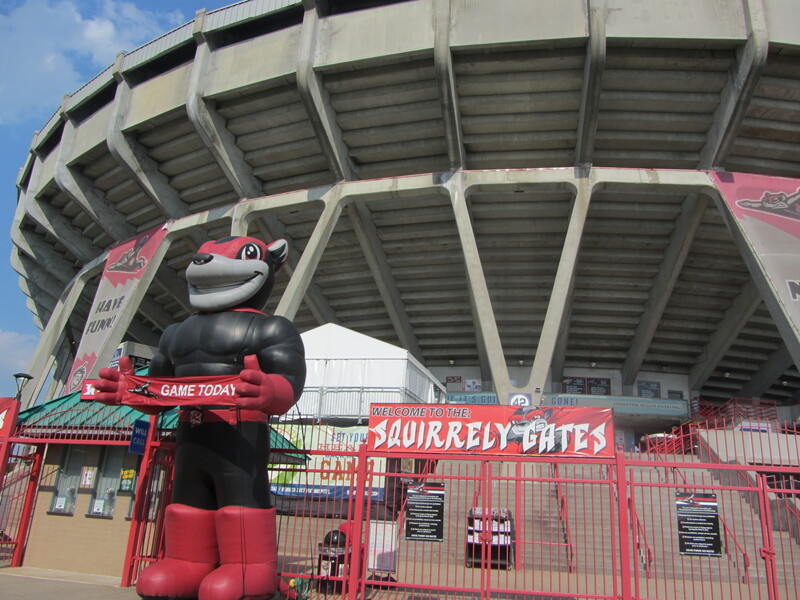 The Flying Squirrels came to town two years later (having relocated from Norwich, Connecticut), wanting to take advantage of the robust Richmond market but also making it clear that the construction of a new ballpark was a prerequisite of the relocation. 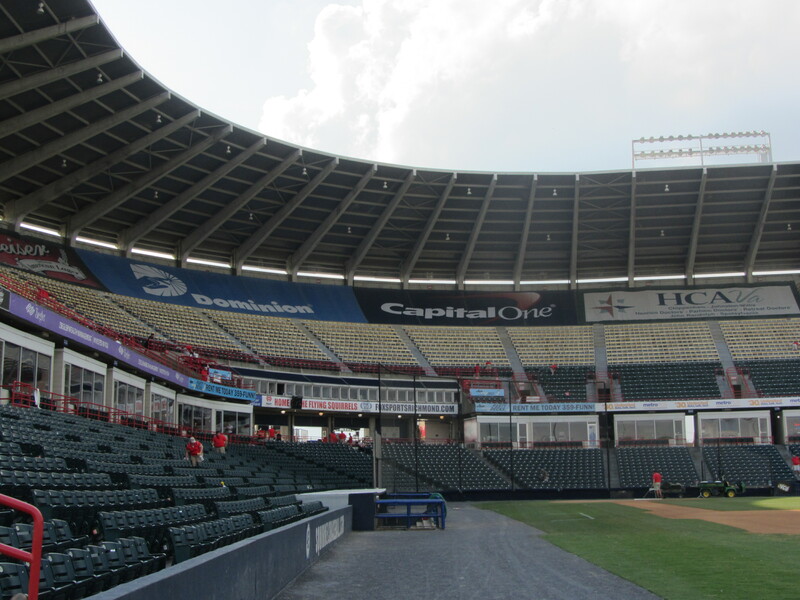 When I visited The Diamond, it was not with the intent of adding to (or detracting from) the ballpark debate. I simply wanted to see it for myself. And as regards that unambitious goal: Mission Accomplished! As you can see, The Diamond resembles a gigantic spaceship. But most spaceships don’t have oversized inflatable Flying Squirrels — that’s Nutzy to you — displayed in close proximity to them. Furthermore, spaceships are almost always devoid of whimsical entrance signage such as the “Squirrely Gates” seen in the above photo. Whimsical signage abounds, in fact. 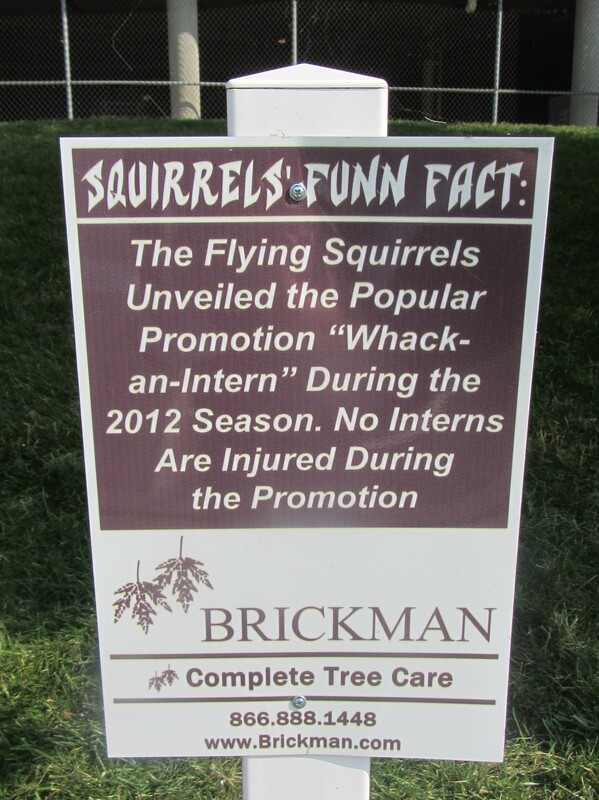 Perhaps Brickman Complete Tree Care has something to do with the stadium’s well-manicured exterior. …where one finds a succinct visual rundown of the costumed characters that can be found within. 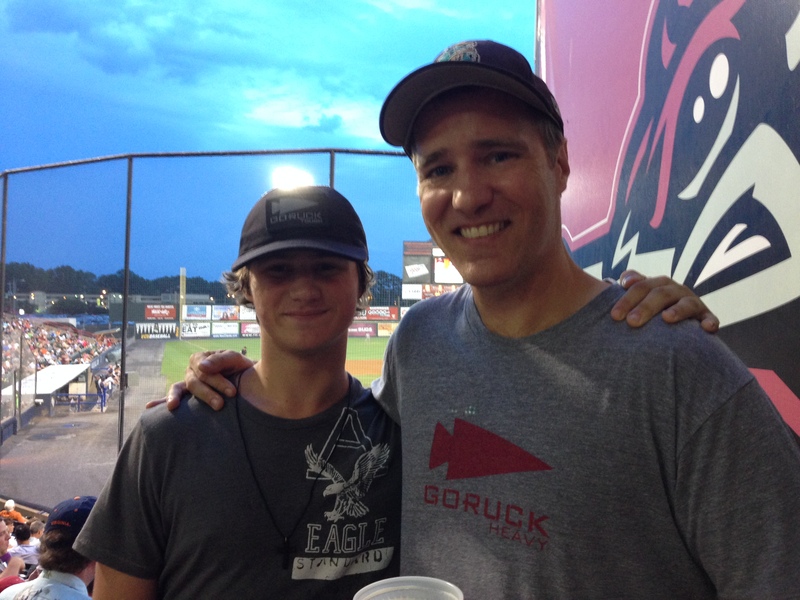 That’s Todd “Parney” Parnell, Flying Squirrels vice-president and well-known industry raconteur. He’s one of those Bill Veeck kind of characters — always upbeat and boisterous, apt to be the first one at the ballpark even if he was the last one at the bar the night before. The “office” seen above is really a re-purposed storage room (or something of that nature), located directly across from the home clubhouse. If you know Parney, then you will not be surprised whatsoever that a makeshift bar is part of the set-up. 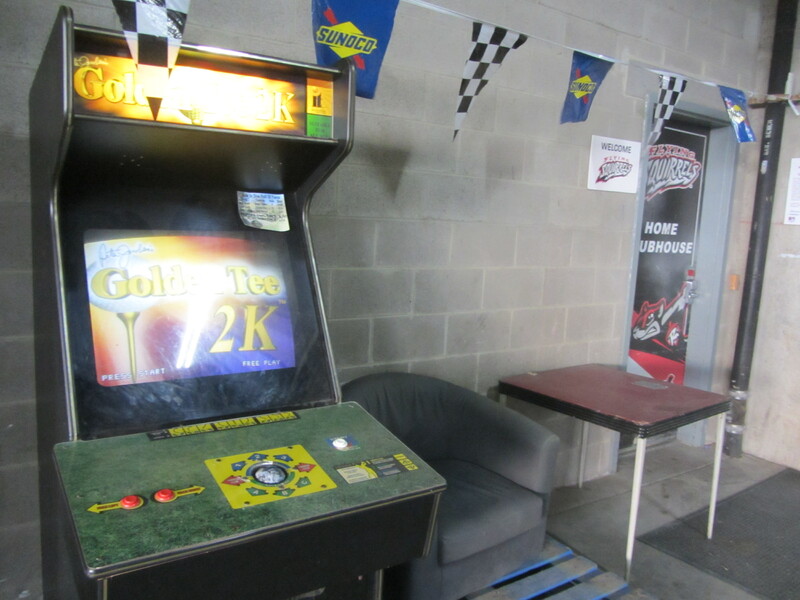 Thanks to Parney’s largess, the home clubhouse has a Golden Tee arcade game sitting just outside its doors. 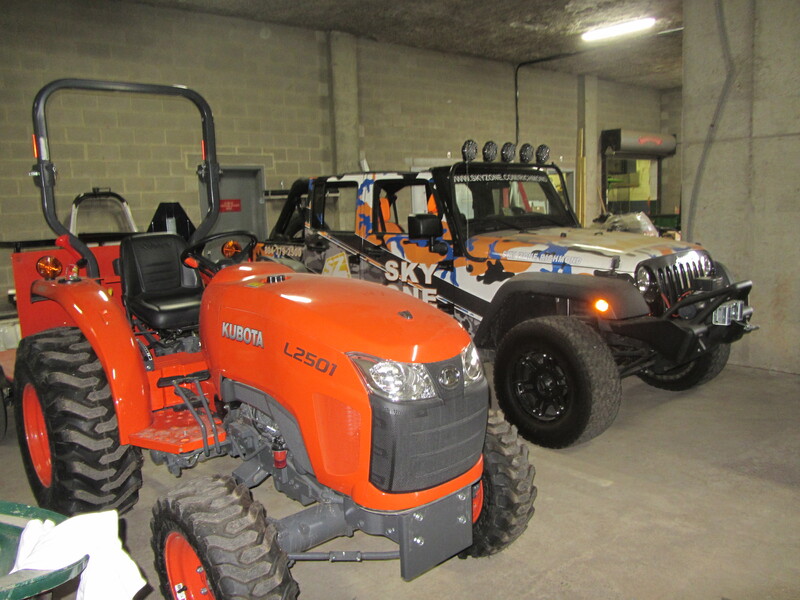 This subterranean locale also doubles as a parking lot, for the players as well as for various team-owned vehicles. That’s one sweet Kubota, is it not? Oh, and a pig lives down here. 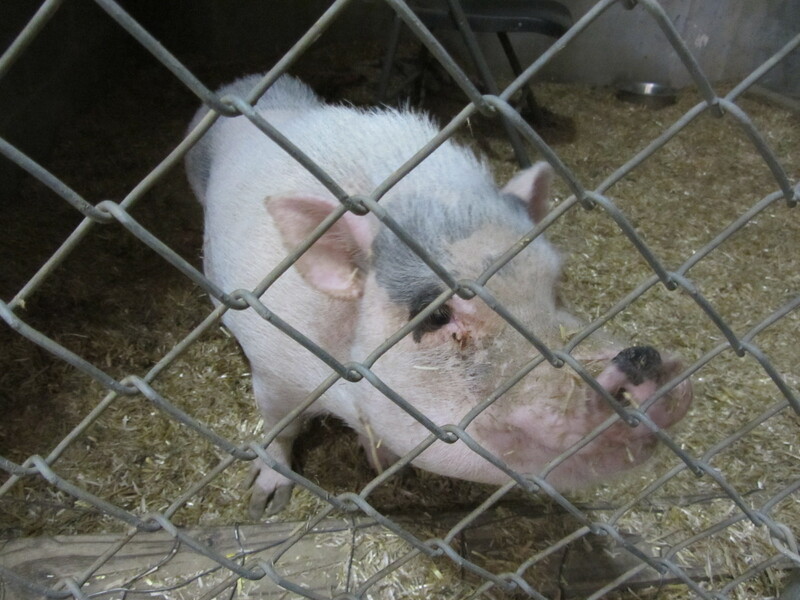 Parker the Rally Pig, specifically. 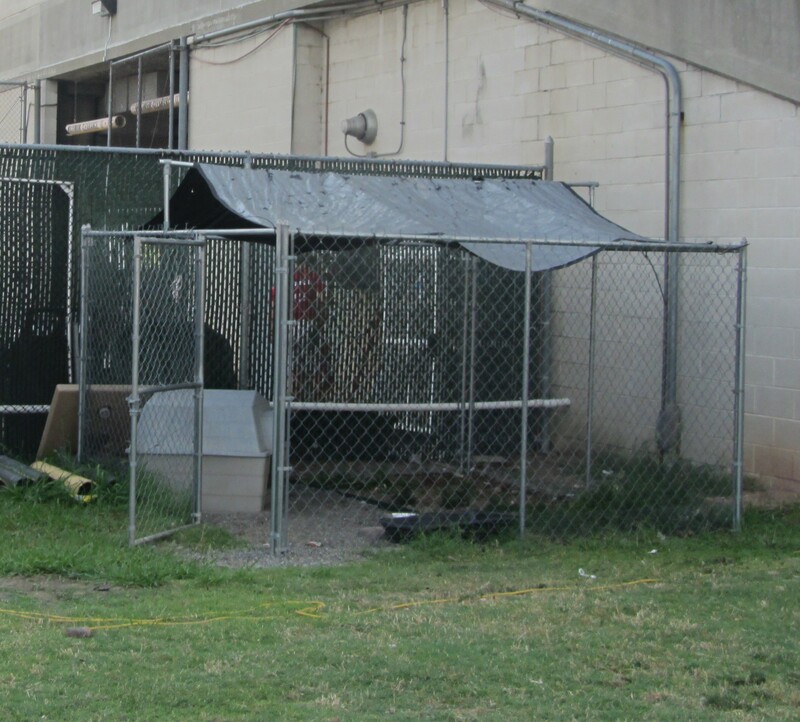 Parker has an outdoor home as well. We’ll see more of him elsewhere within this blogging saga. Remember, like, five photos ago? When I posted an image of Parney? 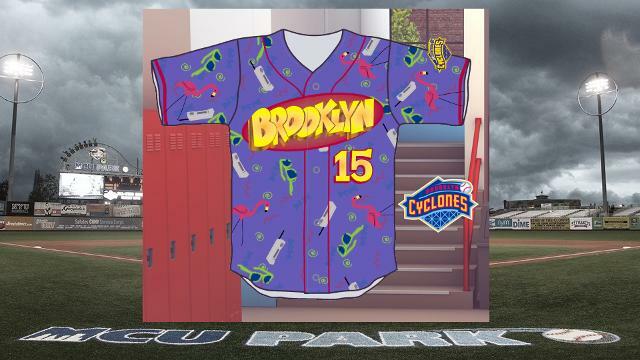 In that photo he is wearing that night’s “Jumanji” theme jersey, the centerpiece of a “Many Faces of Robin Williams” promotion. You know who else was wearing one? Me, as in Ben’s Biz, as in that niche blogger extraordinaire. 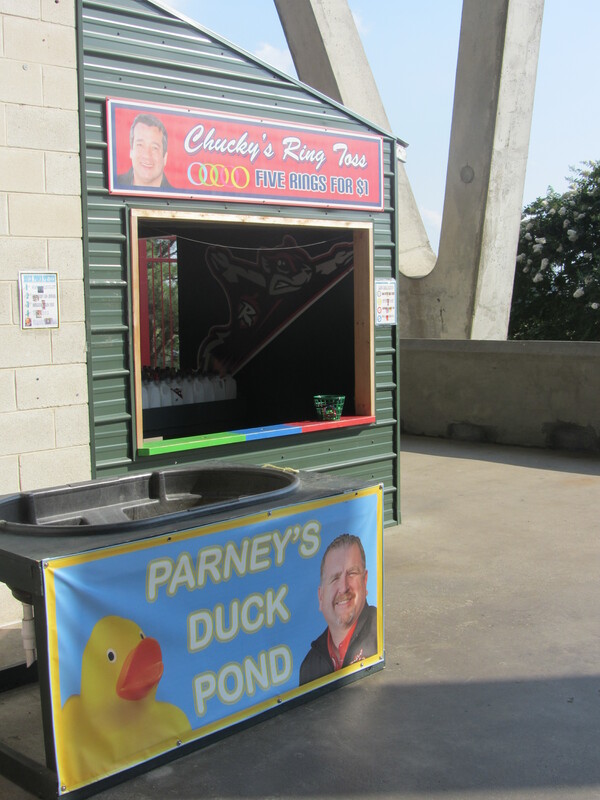 Out on the concourse, it should be noted that carnival games are named in honor of the team’s top brass (Chucky, in this case, is chief executive manager Chuck Domino). 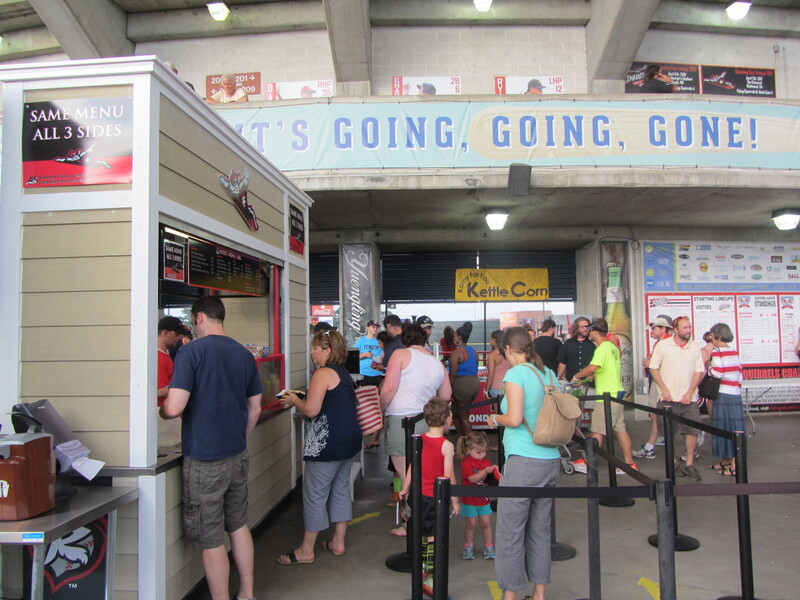 More teams should follow the Flying Squirrels lead in this regard, because kids love Minor League executives and always pester their parents for money whenever they see any kind of entertainment option that features Minor League executives. 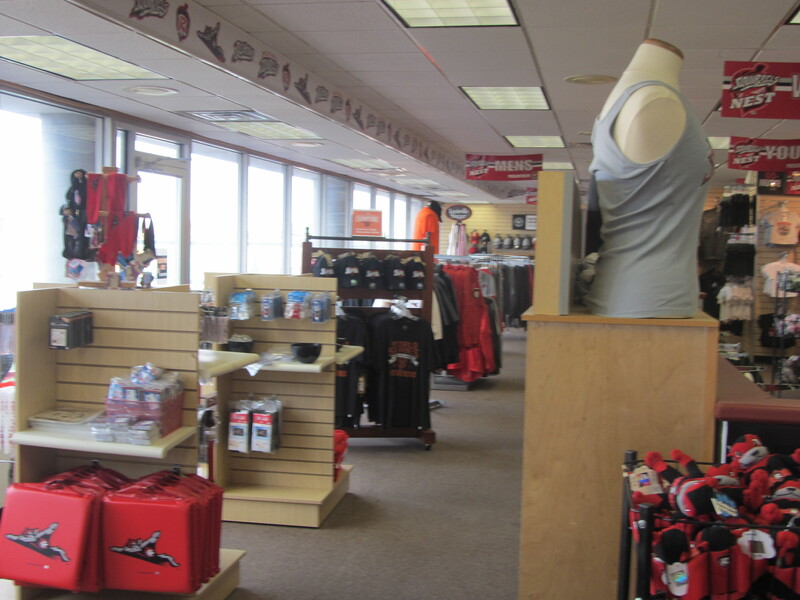 The team store used to be a restaurant. Noted. The main concourse of The Diamond is located on the stadium’s second level (field level consists of storage areas, the clubhouses, batting cages, Parker’s pigpen, Parney’s pigpen, front offices, etc.) 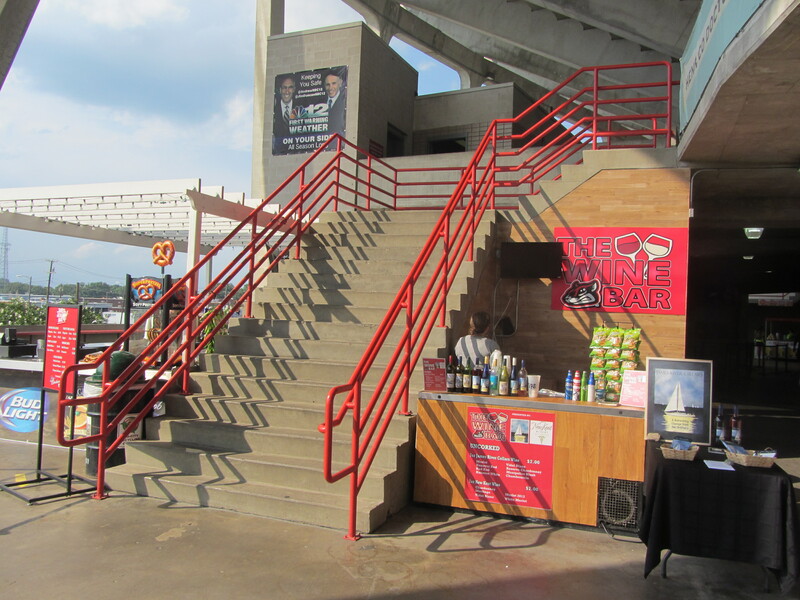 There is also a third-level upper concourse, accessible via staircases such as the above. 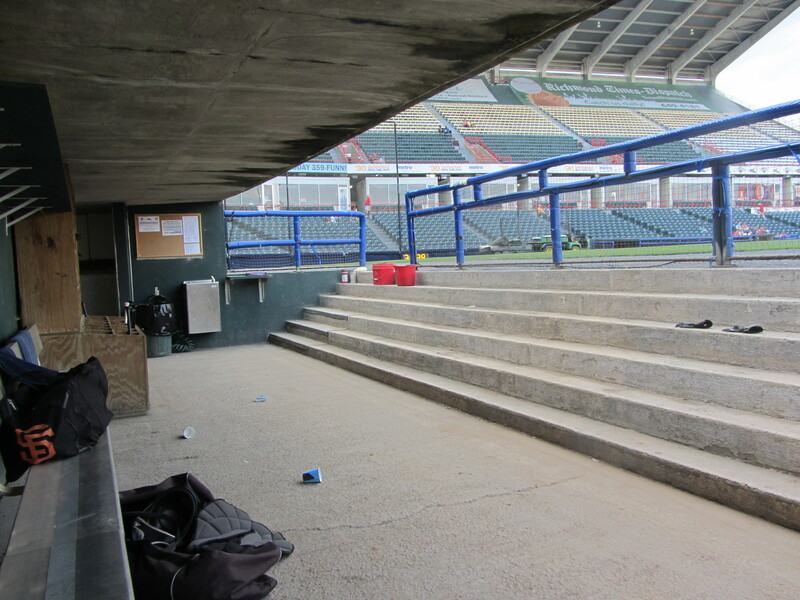 The press box is accessible via the upper level concourse. Most of its denizens had already enjoyed a pregame meal courtesy of Bojangles fried chicken and biscuits. 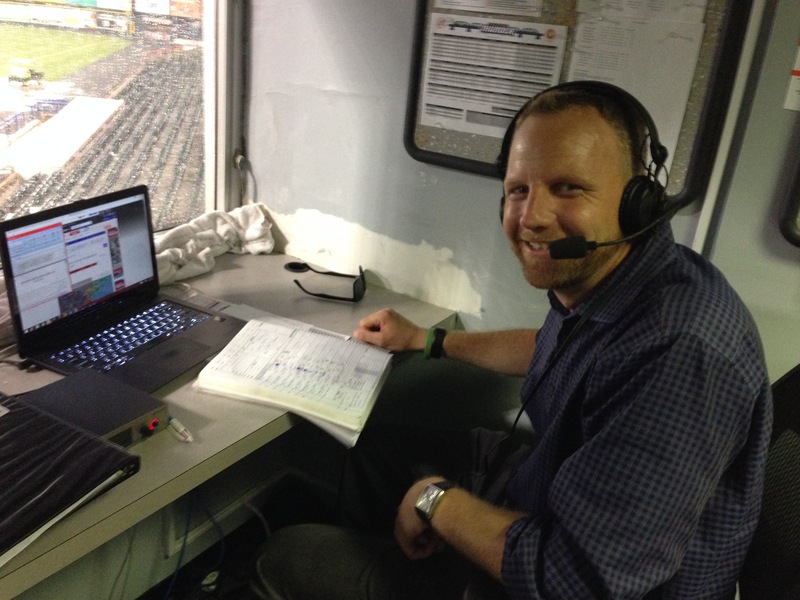 Jay Burnham, Flying Squirrels media relations director and soon-to-be lead broadcaster (current lead Jon Laaser recently accepted a job as voice of the Hokies) was feverishly preparing for what would surely be another stellar broadcast. Not wishing to disturb a broadcasting professional, I tiptoed back down to field level. This time around, the field was less deserted. First of all, I made the acquaintance of on-field emcee Mike Murphy, better known simply as “Murph”. 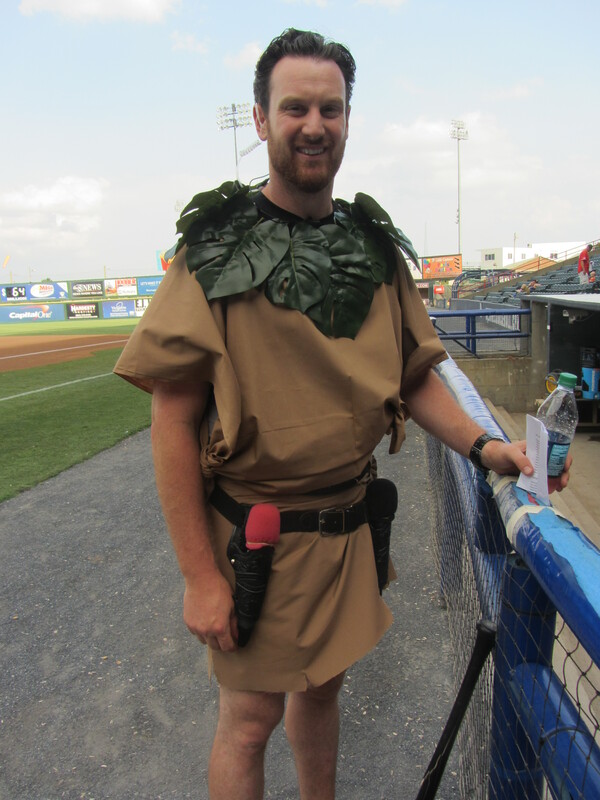 Murph, decked out in his finest Jumanji regalia, had a microphone in his pocket and seemed happy to see me. And, hey, look, it’s Nutzy, just back from the gym. No theme night attire needed for this guy. For Nutzy, it was time to fly off to parts unknown. 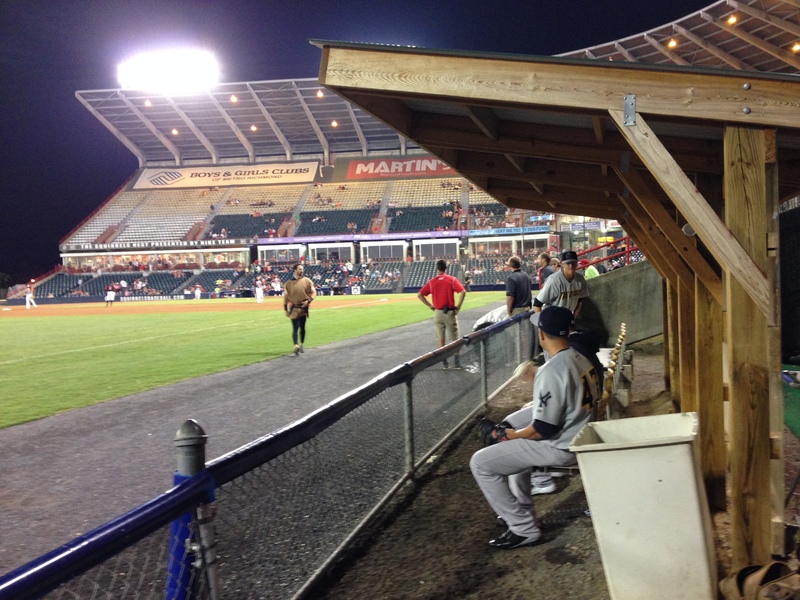 For me, it was time to descend into the dugout and conduct an interview with Flying Squirrels reliever Phil McCormick. I usually don’t interview players for normal reasons, and this was no exception. 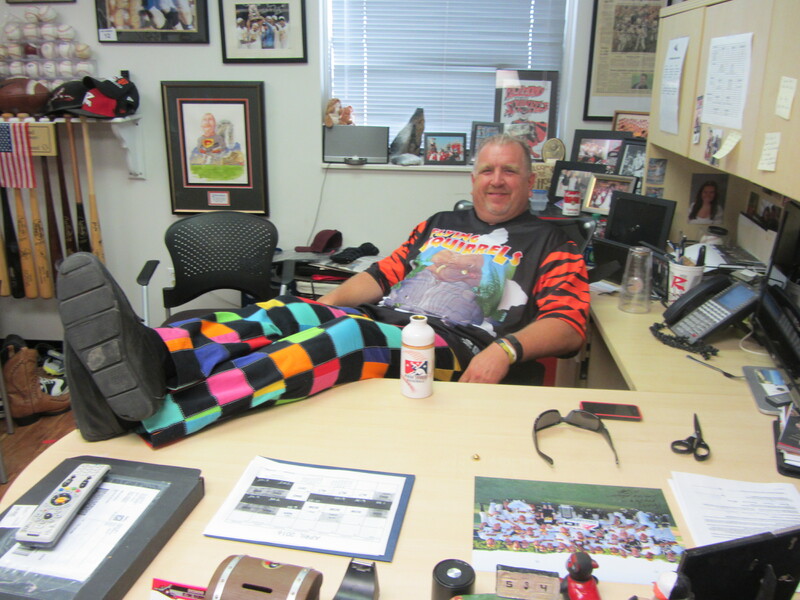 Earlier, when I was in the press box, Burnham had tipped me off to the existence of a recently created Flying Squirrels music video entitled “Biagini in a Bottle.” The song, a parody of Christina Aguilera’s “Genie in a Bottle,” is a tribute to pitcher Joe Biagini sung by McCormick as writhes around in a purple onesie. After speaking with McCormick I interviewed Biagini, the man himself. I then emerged onto the field just in time to throw out a ceremonial first pitch. I had been on a ceremonial first pitch hot streak this season, firing perfect strike after perfect strike, but all good things must come to an end. My first pitch was so bad, in fact, that the weather turned awful as soon as I threw it. God sees all, and He was displeased. And so, to start the evening, a rain delay it would be. 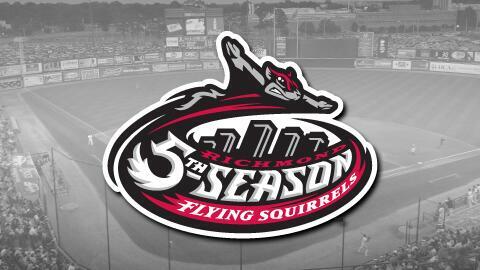 Would this be the end of my Richmond Flying Squirrels experience? Or will I somehow milk two more posts out of it? Only time will tell. This season, when I’m on the road, I’ll be writing a short, on-the-spot blog post about each Minor League ballpark that I visit. Then, upon my return home, I’ll provide the multifaceted blog coverage that you have come to know and, perhaps, even love. Let’s get to it, lest it get to us! 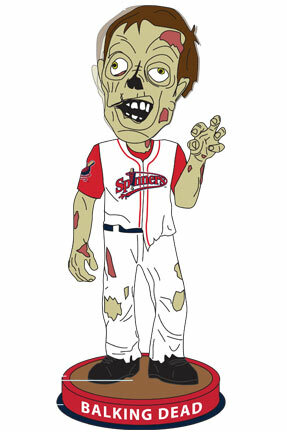 Opponent: Trenton Thunder, 6:35 p.m. scheduled game time. Start delayed by rain for one hour and 19 minutes. “Full House” themed videos, skits and games will entertain fans throughout the night. 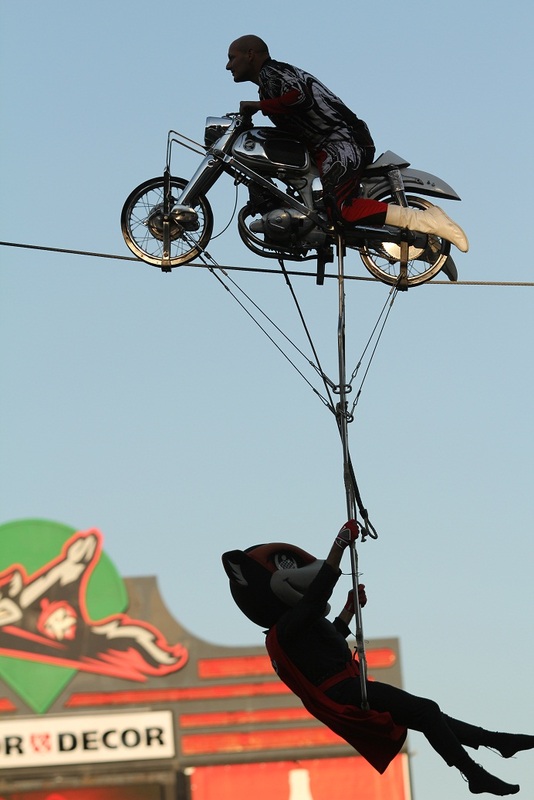 Additionally, the Riders will hold a contest where one lucky fan will win a free trip to San Francisco. A spectacular fireworks show will follow the game, accompanied by classic music from the ’90s. 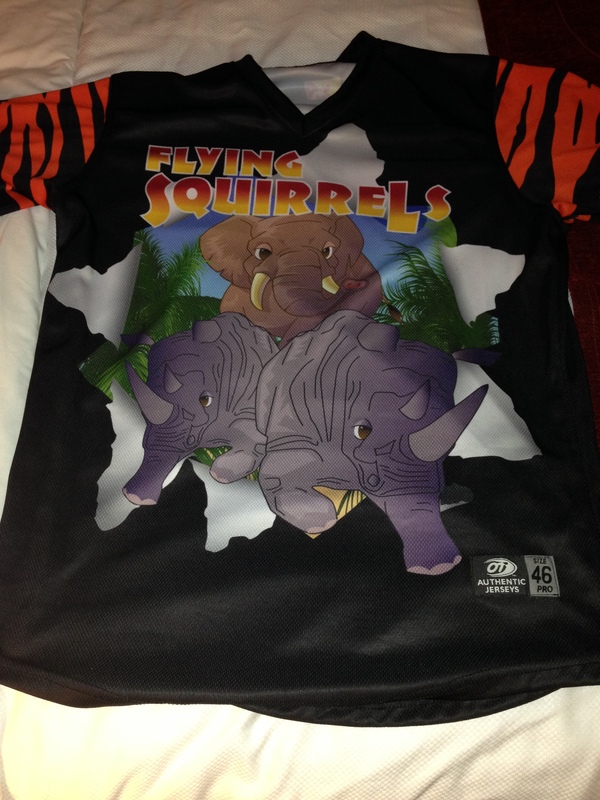 It is also worth noting that the Flying Squirrels have a “Many Faces of Robin Williams” theme jersey on their promo schedule, but no images of that have yet been released. Stay tuned. 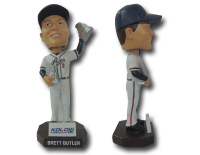 On #Bobbleboobs giveaway night, 8/22, perhaps @ChasRiverDogs can become honorary members of the NYPL? Ben’s Biz Blog: Still the original, still the best, still inexorably encroaching upon middle age while writing about some of the most ridiculous stuff imaginable. 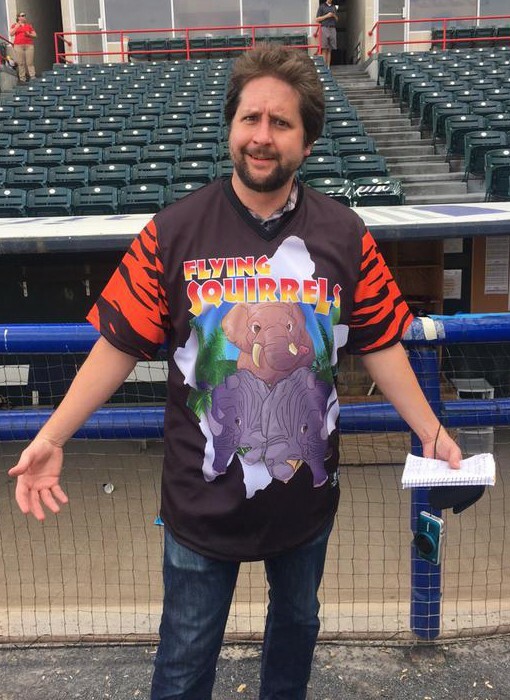 This week I have been aware of a distinct shift in the tone and tenor of the national Minor League Baseball conversation. 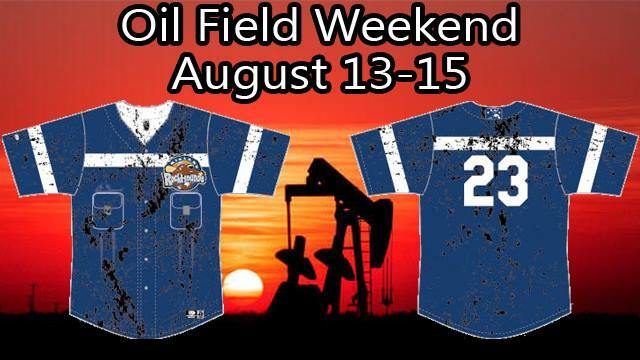 Valentine’s Day promos and borderline insane snow-related ticket deals are on the way out, as the primary focus is now on the 2015 season that soon will be. Promotion schedules are being released at a rapid clip, and as a result Opening Day know feels like a tangible thing as opposed to a vague abstraction. Meanwhile, the Charlotte Knights will have a Delorean on the premises. 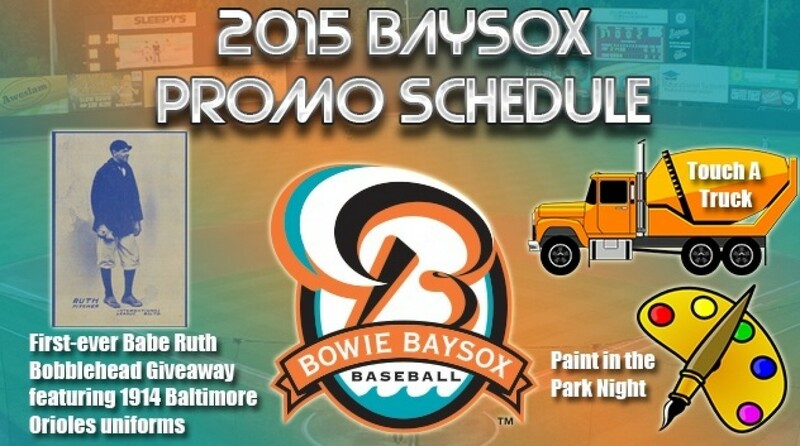 While currently lacking a distinct visual to go along with it, the Bowie Baysox announced that, on July 19, they will be giving away a Babe Ruth bobblehead in which he is wearing the uniform of the 1914 (Minor League) Baltimore Orioles. This is, in a word, great. 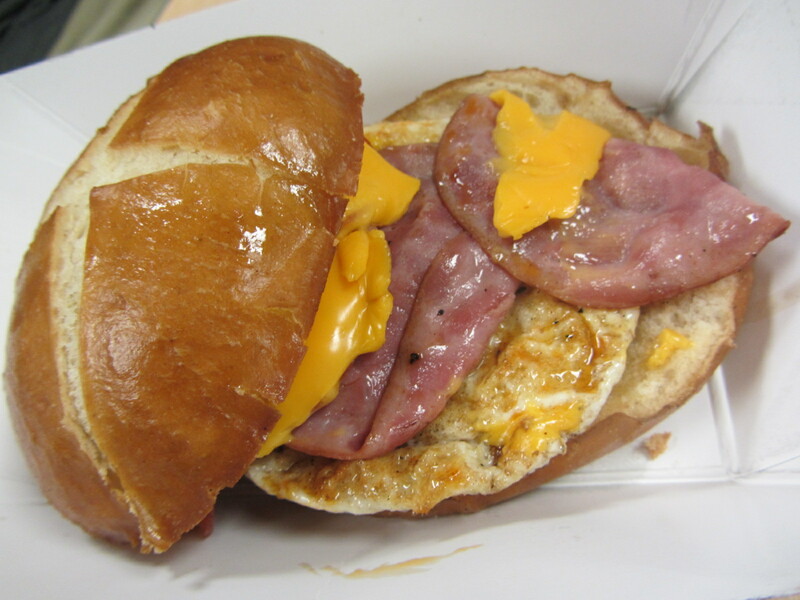 Fans will have a sizzlin’ good time at the first ever ‘Bacon and Eggs Night’ at Fifth Third Field. 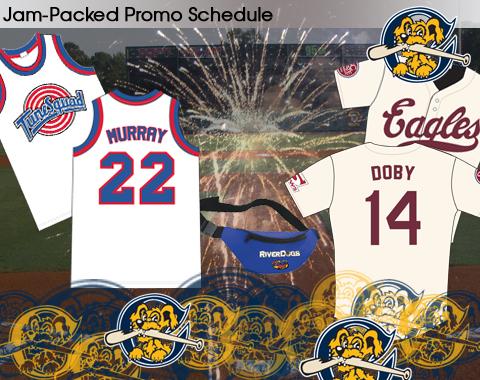 Things will heat up when the Hens take the field wearing egg-themed jerseys and hats against the Lehigh Valley IronPigs, who will be wearing their popular bacon-themed jerseys. 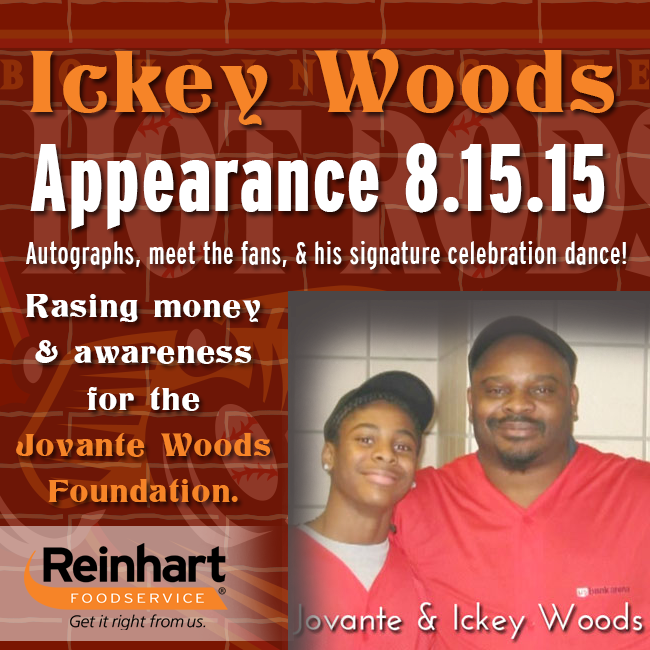 Woods will sign autographs, mingle with fans, and showcase his signature celebration….His appearance will be joined by specials on cold cuts, and Woods will lead Bowling Green Ballpark in an attempt to break the record for the most “Ickey Shuffles” done simultaneously in one location. You’ll have to use your imagination for now, but the Richmond Flying Squirrels are giving away Joe Panik “Panik Buttons” on July 21. Star Wars promotions have become an epidemic throughout Minor League Baseball. 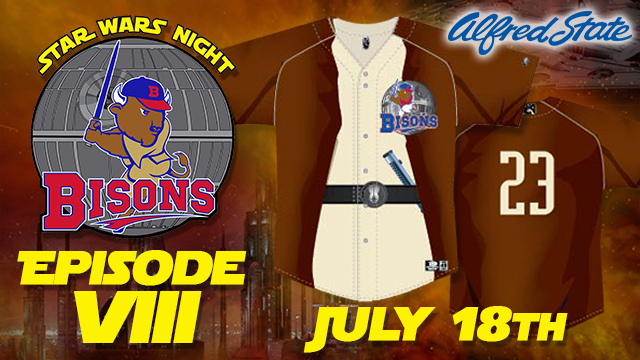 The Buffalo Bisons, one of many teams to tie a theme jersey into the evening’s attractions, will be wearing “Jedi Robes” on July 18. Finally, we have the Lakewood BlueClaws. 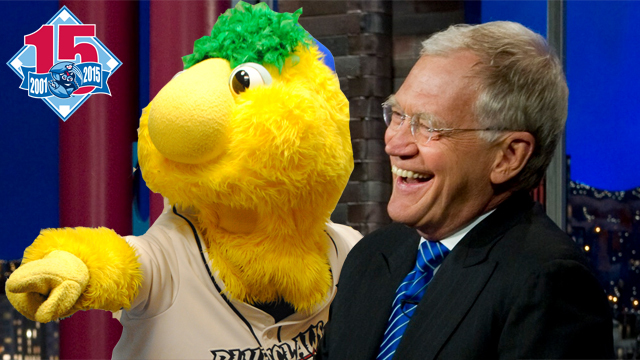 On May 22, two days after David Letterman signs off from the airwaves, the team is staging a promotion in honor of the iconic late night host. If you’re wondering why they would do such a thing, then simply consult the BlueClaws’ Top 10 List. This post represents a mere smattering (is there any other type of smattering?) of the notable promotions that will be staged in 2015. Stay tuned, as there will be (too) much more where this comes from. 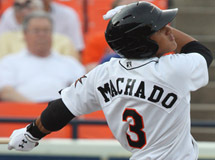 Can Minor League Baseball be stopped? No, it cannot be stopped. For the past six months, the material on this blog has been almost entirely devoted to “On the Road” stadium visit recaps. I hope that you enjoyed reading these posts, and if you haven’t read them then I hope that you might soon take the time to do so. But now it’s time to move on, psychically unencumbered, to something that I haven’t done for a while: a full-to-bursting Ben’s Biz Blog bouillabaisse! This will be the first in a randomly occurring series of posts in which I dig into my email vault of blog-worthy items from the season that was. 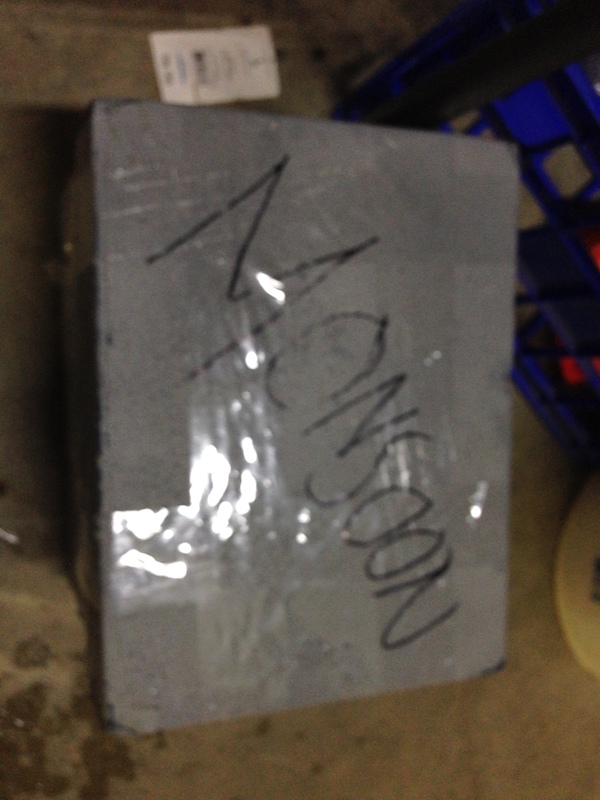 Let the randomness begin! Randomness such as, oh, I don’t know, a Durham Bulls fan tweeting in the guise of a Game of Thrones character. Mur Lafferty, or @mightymur as she is known on Twitter, is a Campbell Award winning author who covers games from a very unique perspective — through the eyes of Game Of Thrones character Sansa Stark. She calls it #Sansaball and being the nerds that we are (see Star Wars Night jerseys), we look forward to this every time she’s in the building. 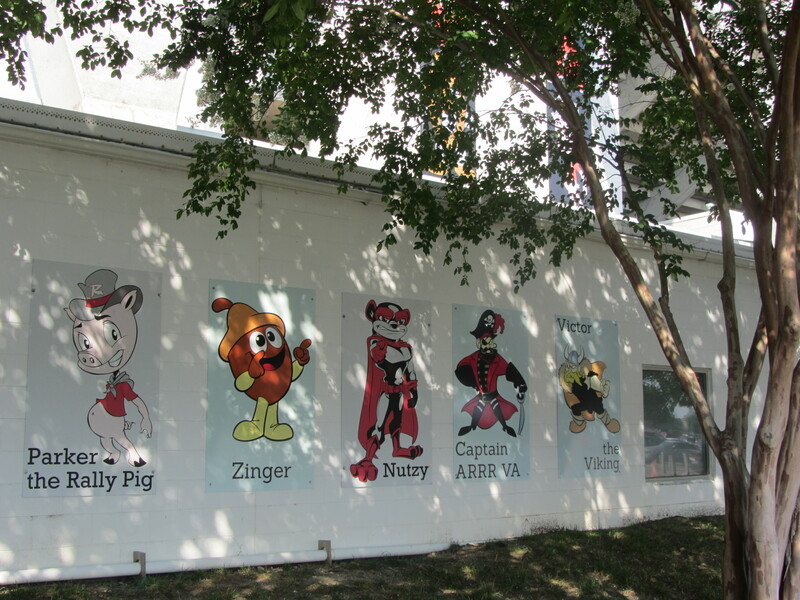 That picture was taken way back on Opening Day, as Richmond Flying Squirrels mascot Nutzy entered the building in a most memorable fashion. The evening also ended memorably. 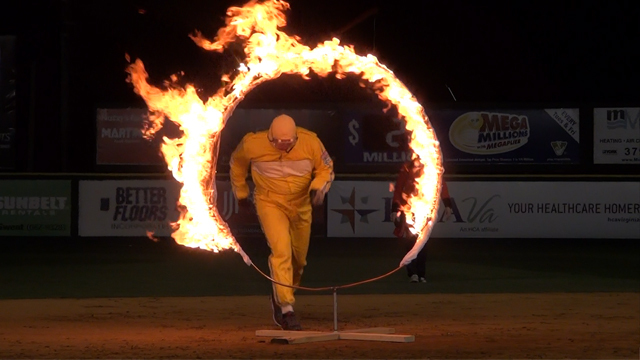 Flying Squirrels team president Todd “Parney” Parnell did his best Johnny Cash impersonation by jumping through a ring of fire. 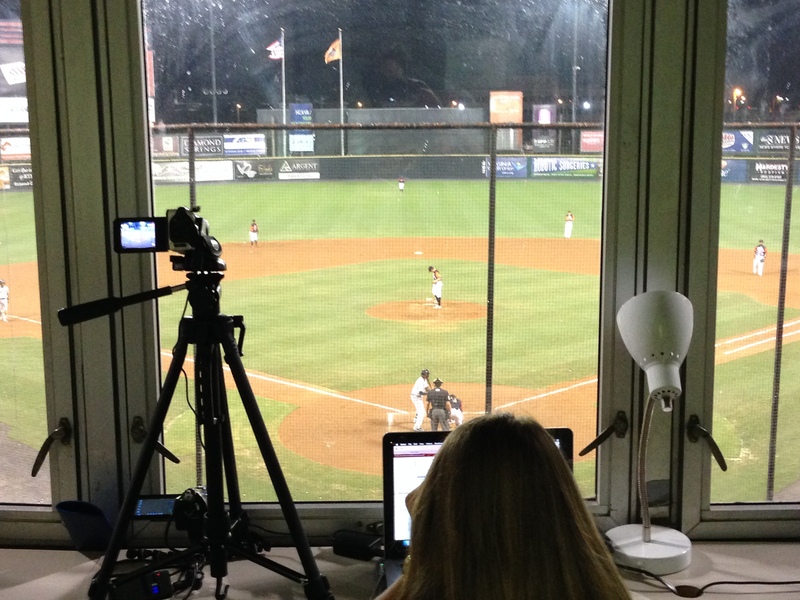 Moving on from Johnny Cash to the Beatles, it’s now time to take a look at “A Day in the Life” of a Minor League employee. 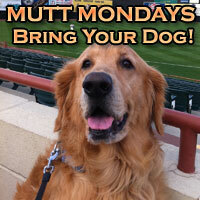 This video was made by Greg Monahan, the Lansing Lugnuts on-field host and a graduate student at Michigan State. It was made as part of a school project, and it is well worth your time. And that will be it for today. Now that I’m back from vacation and all of my road trip content is in the rear view, this blog is officially in offseason mode. I’ve got plenty of material to share, but am always looking for more. If there’s something that you’d like to see covered, or if you are interested in potentially writing a guest post on a relevant Minor League topic of your choice, then please get in touch. Like Richard Marx, I will be right here waiting for you. February 14 is a day when most people are either pitching woo or lamenting the absence of woo while listening to Wu-Tang Clan songs that sample John Woo movies. I, meanwhile, devoted a chunk of my always productive and multi-faceted work day to a blog past entitled “The Marking of Momentous Milestones.” It dealt with anniversary logos. 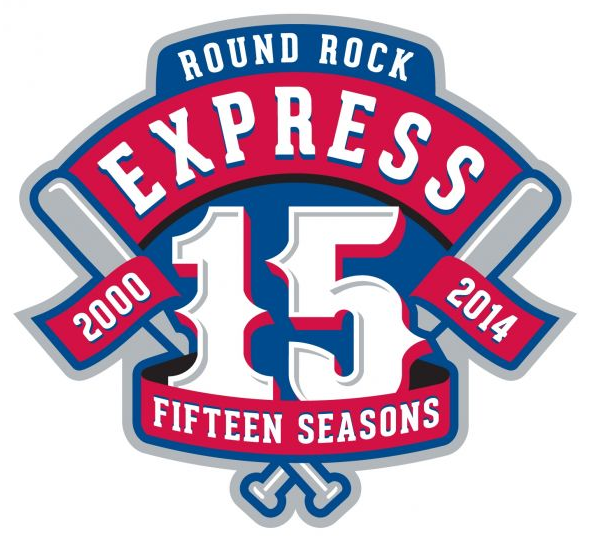 Let’s start with the Round Rock Express, who are celebrating their Quinceanera. 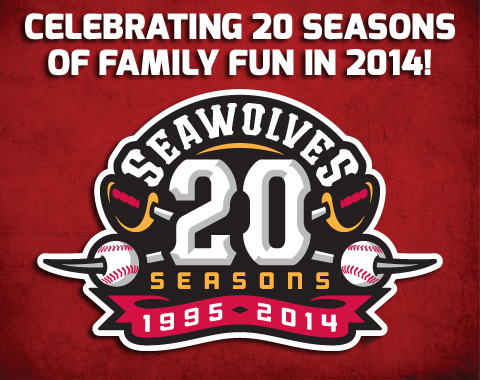 While it’s true that you can’t spell Quinceanera without “Erie,” the SeaWolves are even older than that. Read all about their 20th anniversary plans HERE. 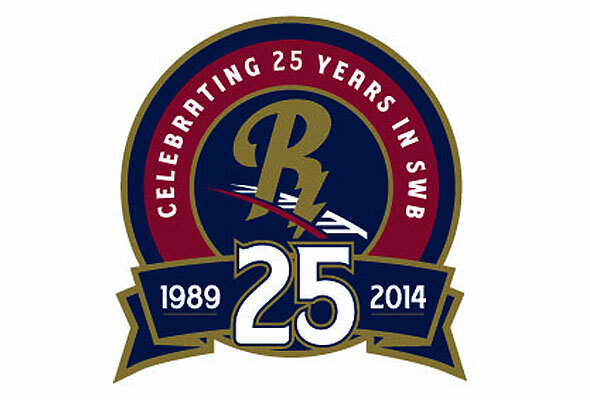 Five plus 20 equals 25, which is the number of seasons in which Scranton/Wilkes-Barre’s International League franchise has been operational. 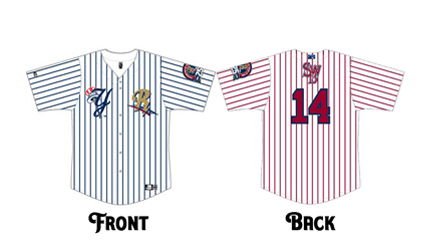 The RailRiders will be celebrating this anniversary throughout the season, including wearing a theme jersey that incorporates their three distinct identities (Red Barons, Yankees, RailRiders) into one coherent (?) whole. Yes, I’ve jumped from a 15th anniversary to a fifth anniversary to a 20th anniversary to a 25th anniversary. But there was a pattern to the order in which I shared the above logos, and it wasn’t numerically related. Anyone have any guesses? Meanwhile, I’m barely more than half-way through my self-imposed blog post word minimum, so let’s keep this train rolling. 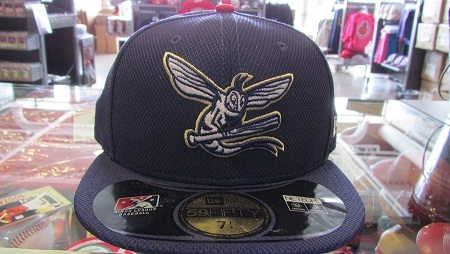 The Harrisburg Senators have unveiled a new batting practice cap, which honors the insects that used to rain down upon fans during night games at City Island. 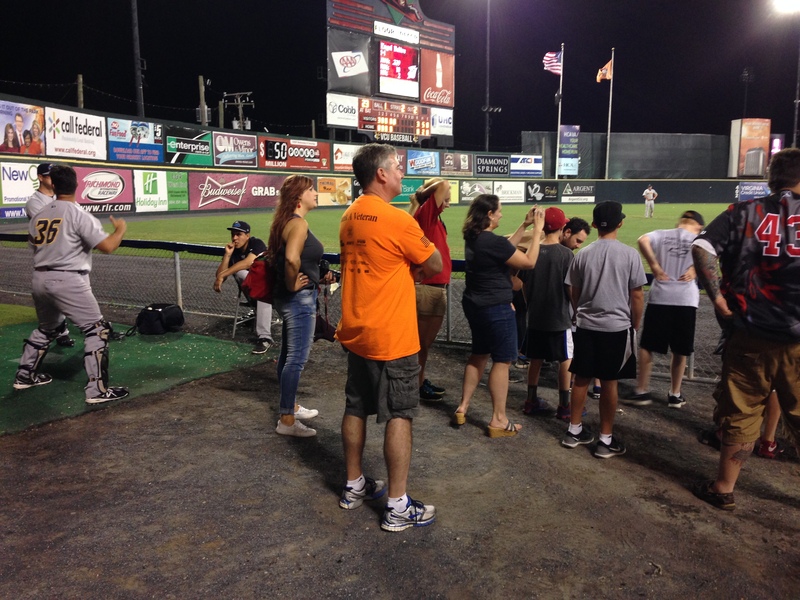 Mayflies, obviously huge fans of the team, have been known to hang out around Metro Bank Park, home of the Harrisburg Senators, on humid summer nights. These harmless little bugs are hatched near the banks of the Susquehanna River. The mayfly has a short lifespan and is fond of the bright lights of the ballpark. They can often be seen near the stadium light poles around 9:00 p.m. on a game night during the summer months. I am done writing this blog post.